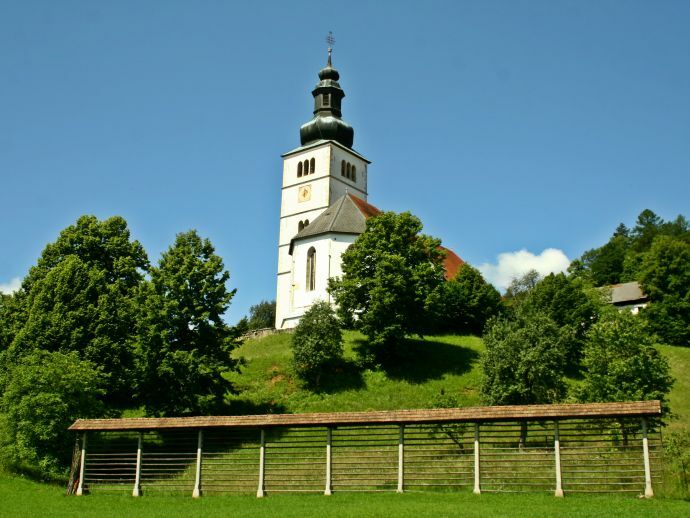 The Church of the Annunciation in Crngrob near Škofja Loka is among the most notable of Slovenia’s 800+ churches. 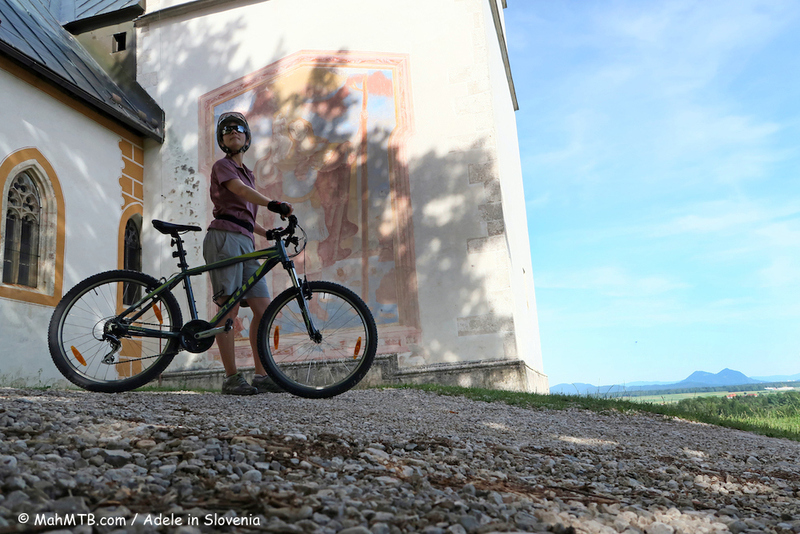 You can easily reach the church by car, however, if time permits I suggest setting off on foot or by bike from the centre of Škofja Loka along the Path to Crngrob theme path, where along the way you can see numerous shrines and admire the pleasant Škofja Loka countryside. 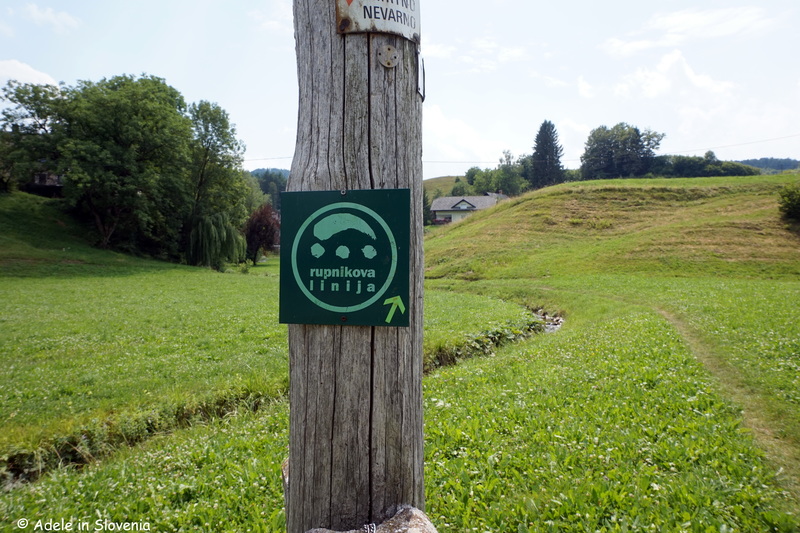 The path, which is marked with a yellow circle with a white inner, is relatively level and mostly on quite country lanes. 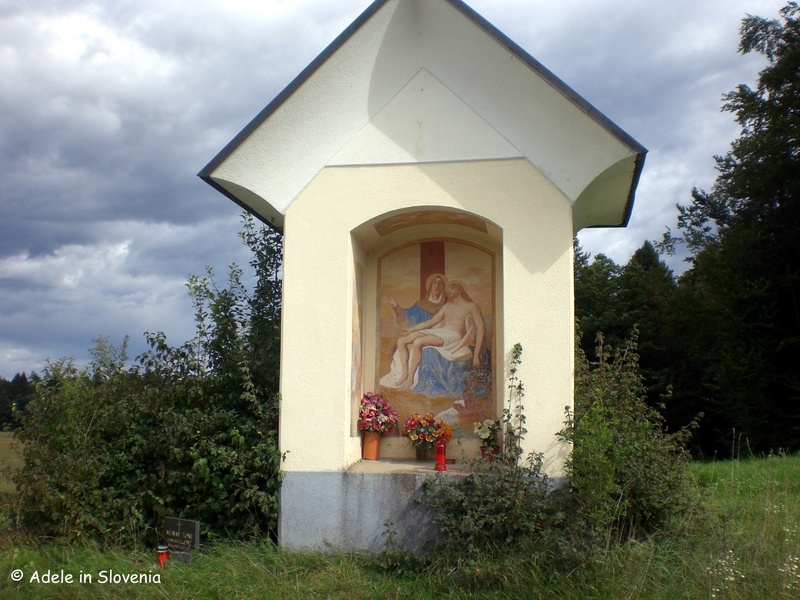 You first pass the shrine of Pieta, the work of the well-known Slovenian impressionist painter Ivan Grohar. 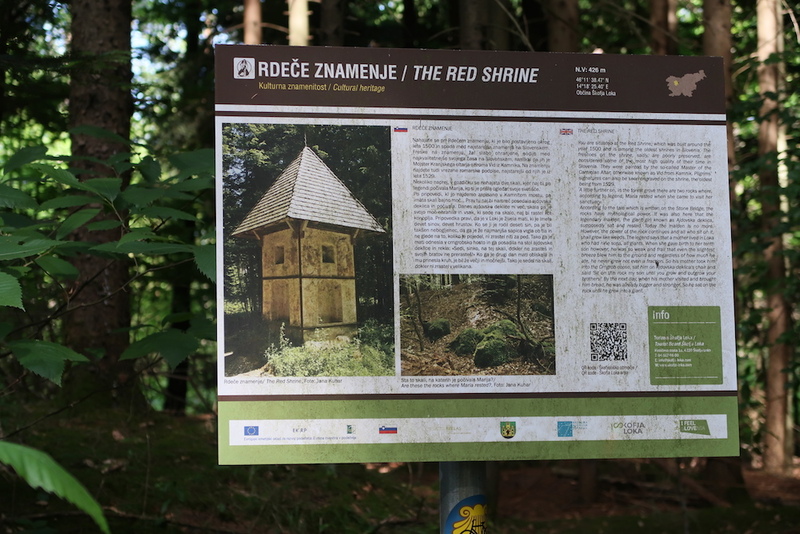 The Red Shrine, which was erected at the beginning of the 16th century as a reminder of the plague, is one of the oldest shrines in Slovenia. 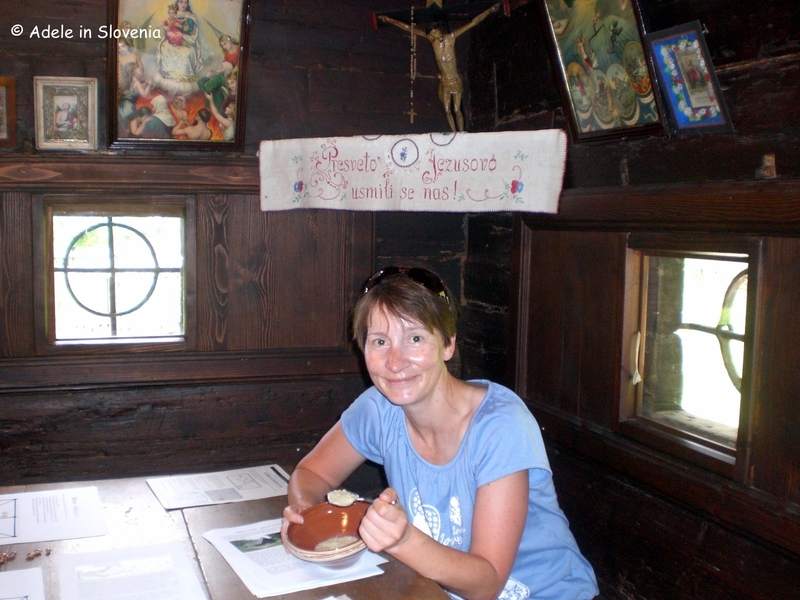 A few minutes on you reach the village and church. Though from afar the outside of the church doesn’t look particularly remarkable, other than the fact it is a particularly large church for a village with just a handful of houses – the reason for this is that it was intended for pilgrims – as you get closer and glimpse the large fresco of St. Christopher on the exterior, and another of Holy Sunday in the shelter of the neo-gothic porch, you begin to get a sense this is no ordinary church. 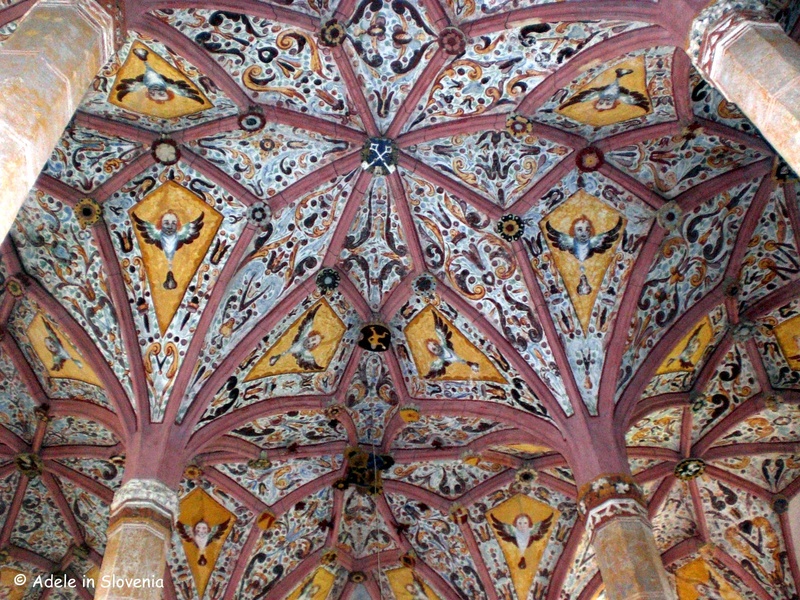 Then you step inside and see the full beauty of the ornate interior, particularly the gold baroque altars and magnificent painted ceiling, you will soon realise why it is considered among the most valuable churches in the country. 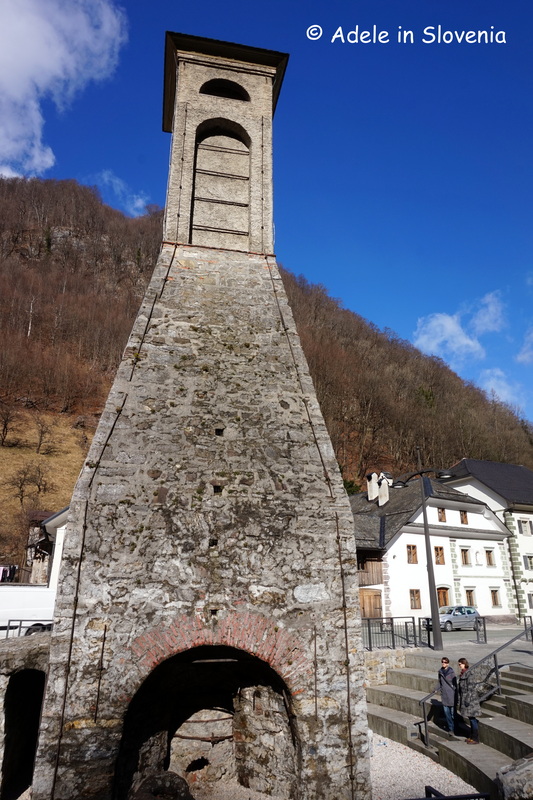 It was originally built in the 13th century and extended over time with the bell tower dating from 1666 and the neo-gothic porch being added in 1858. 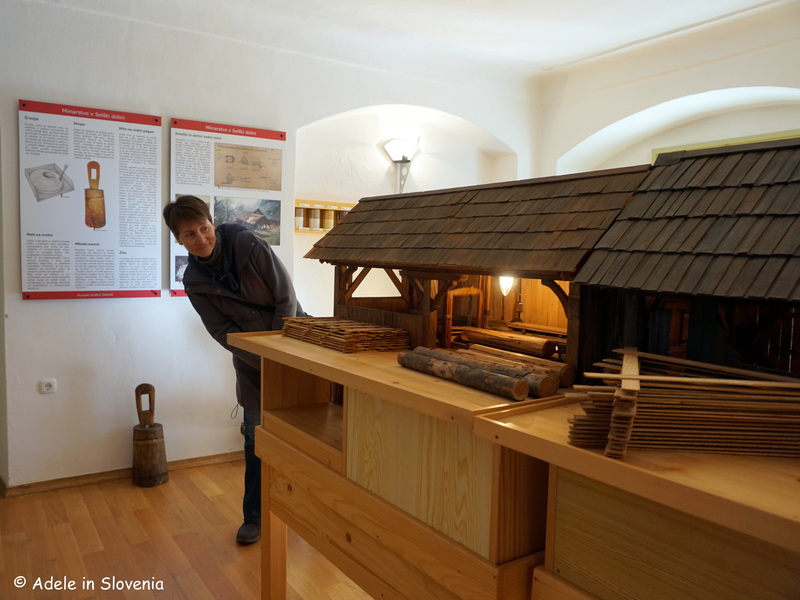 As befits something of such value, the church is kept locked, therefore to arrange to a guided tour of the interior you should contact Tourism Škofja Loka by email (info@skofja-loka.com) or by calling +00386 45 170 602 or +00386 41 424 776. 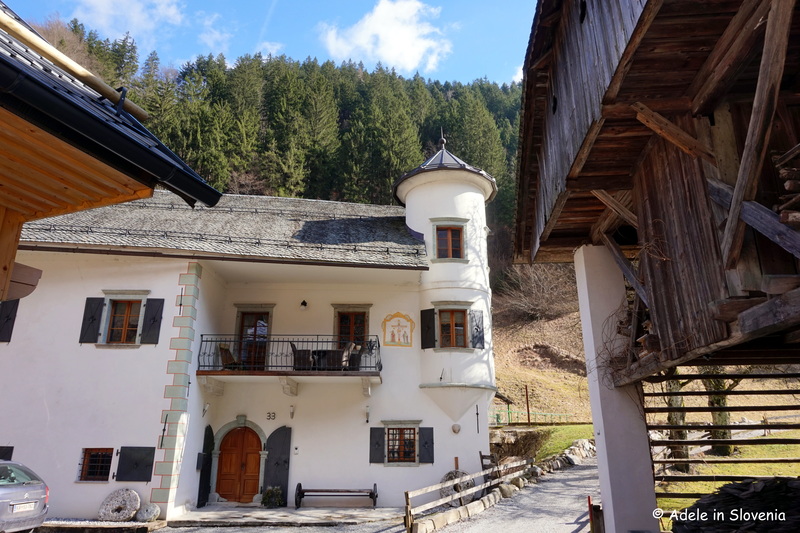 I recommended combining a visit to Crngrob with a stay or a visit to the Pri Marku tourist farm, which is situated just a few hundred metres from the church. 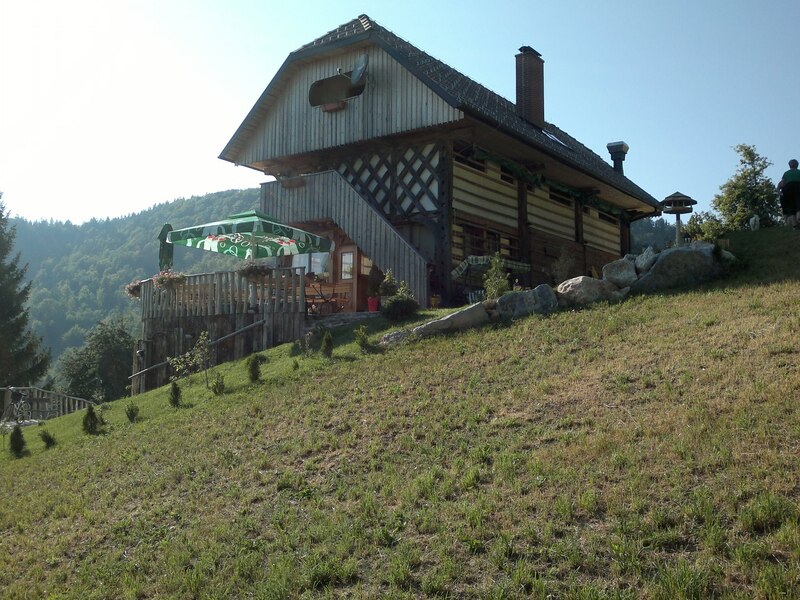 The farm’s setting is idyllic, surrounded by rolling green hills, the church as a backdrop, and though only 5kms from Škofja Loka, it has a real air of being far from the hustle and bustle of life. 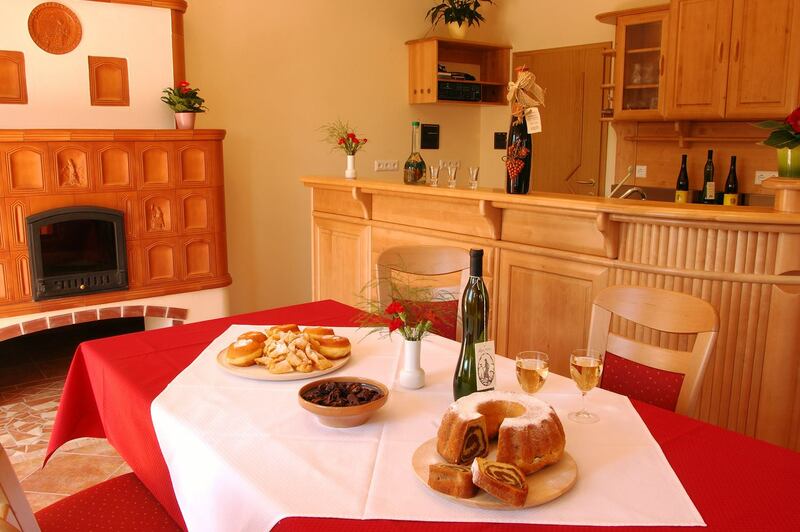 Pri Marku has 10 well-appointed rooms, or for a different experience you can also stay in the farm’s hayloft. All rooms come with a view! You can get to know the farm’s animals – this one seemed very keen to get to know me! 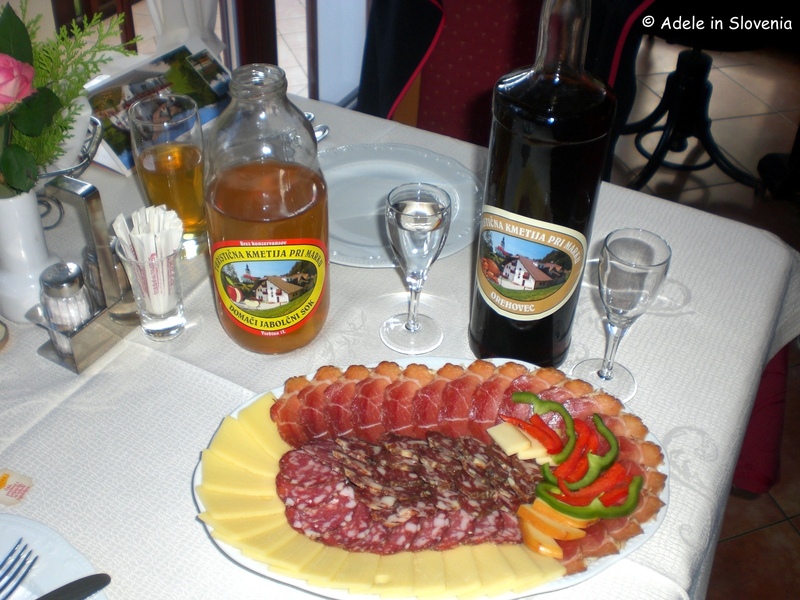 Of course no Slovenian tourist farm is complete without delicious home-made, home-produced food and drink! 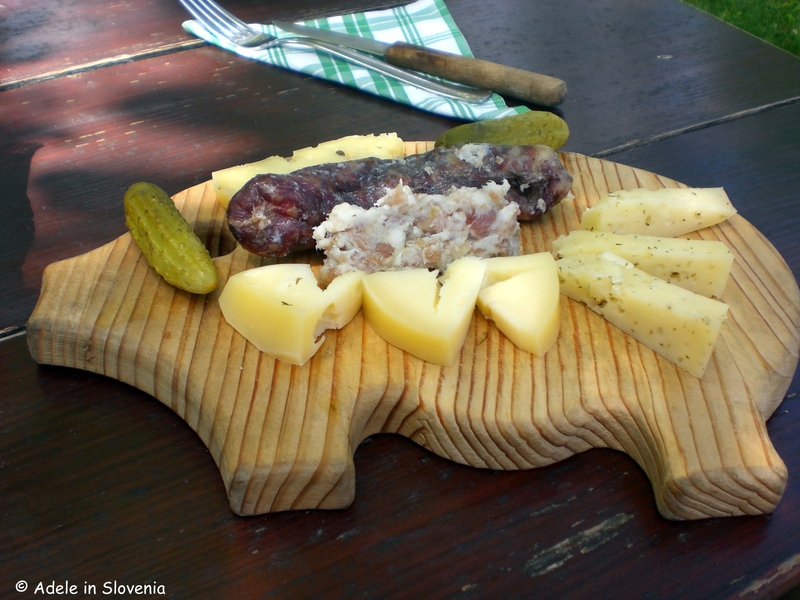 Those staying at Pri Marku have half-board, but you can also drop by for a snack or a hearty lunch at weekends (prior booking essential) and try some other traditional Slovenian dishes and house specialities. 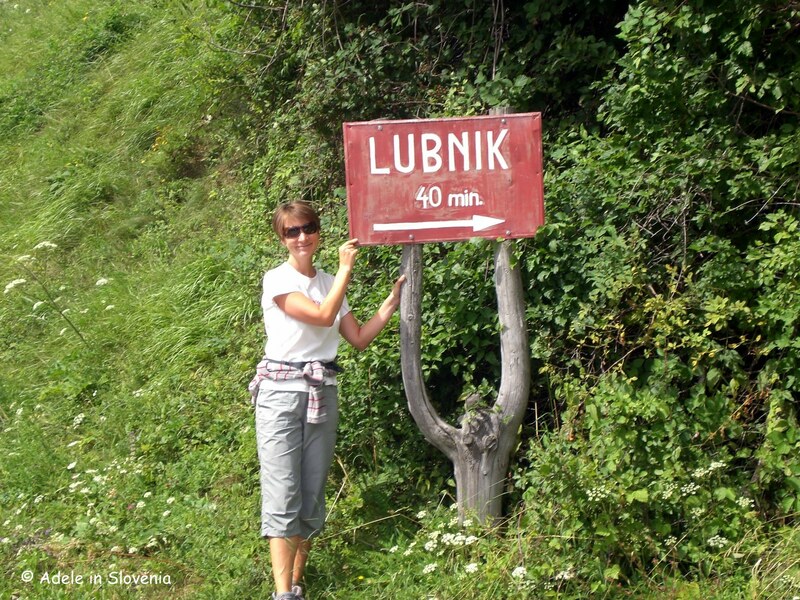 Lubnik (1025m) stands prominently above the town of Škofja Loka and is a favourite, and very accessible, hiking destination. There are a number of paths to the top. 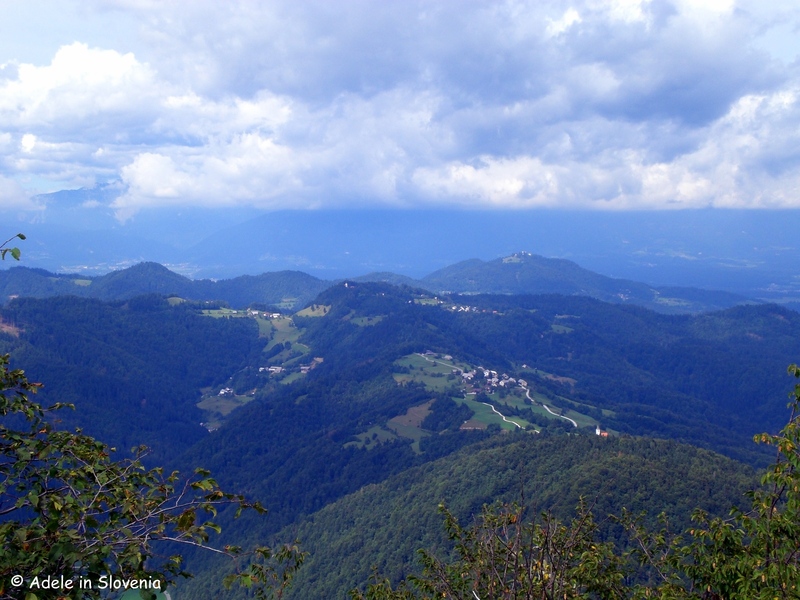 You can start directly from the old town centre and take the marked path via Loka Castle and Gabrovo, from where it takes about 2 hours to reach the Dom na Lubniku mountain hut or, for a shorter hike, drive up the windy road to the village of Breznica pod Lubnikom, from where it takes just 40 minutes to reach the top and where the views are already inspiring. 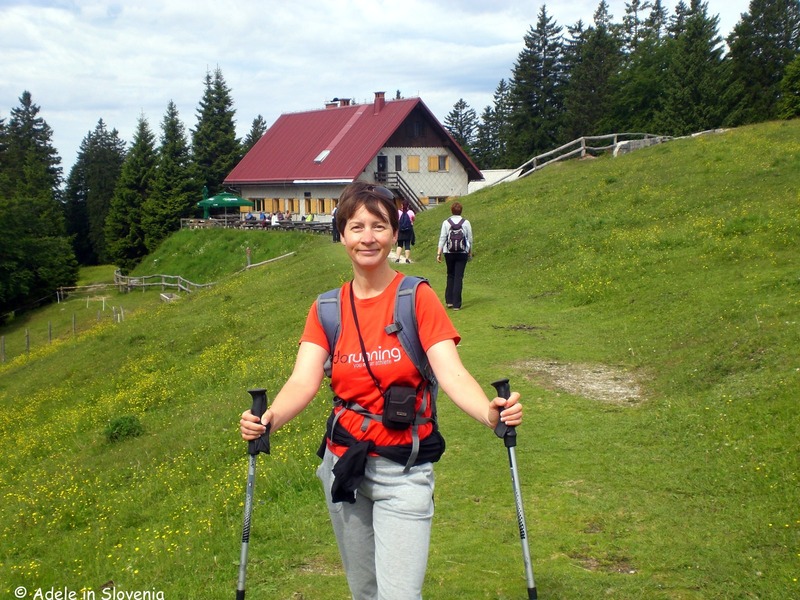 As regular readers of my blog will know, I have a penchant for taking the longest possible hiking routes to reach my destination, and much prefer to walk or cycle rather than drive – anywhere and everywhere! 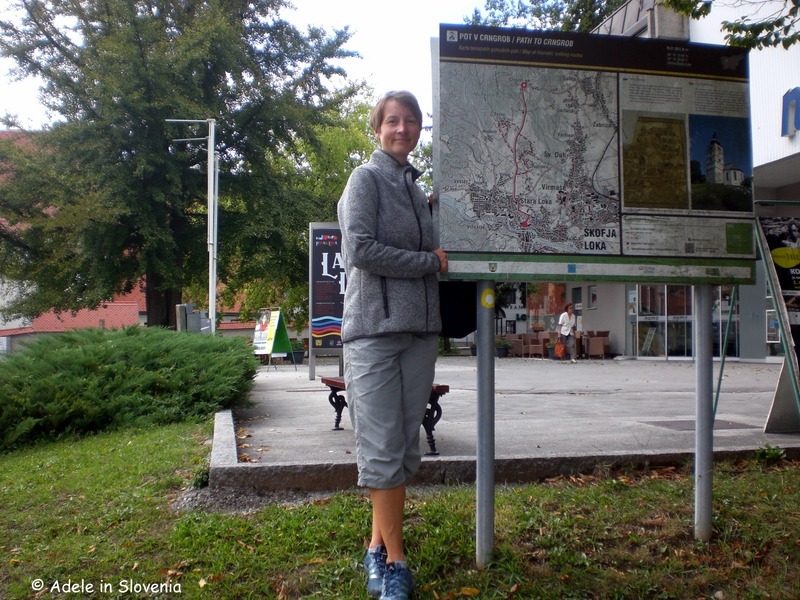 However, I had an ulterior motive, or rather two, for choosing the shorter route in this case, namely to visit the Okrepčevalnica Malina snack bar and to find out more about the nearby Kevderc cave. 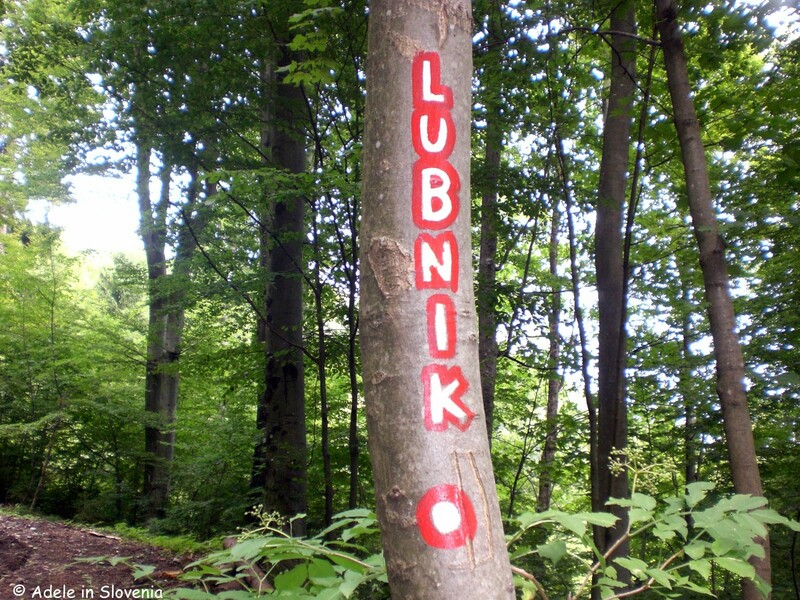 Whichever path you choose to Lubnik, you will find that they are all very well-marked with the usual red circle with a white inner painted on trees, rocks etc., so orientation isn’t a problem. The path is almost entirely through the forest, so even on the hottest of days it is pleasantly cool. 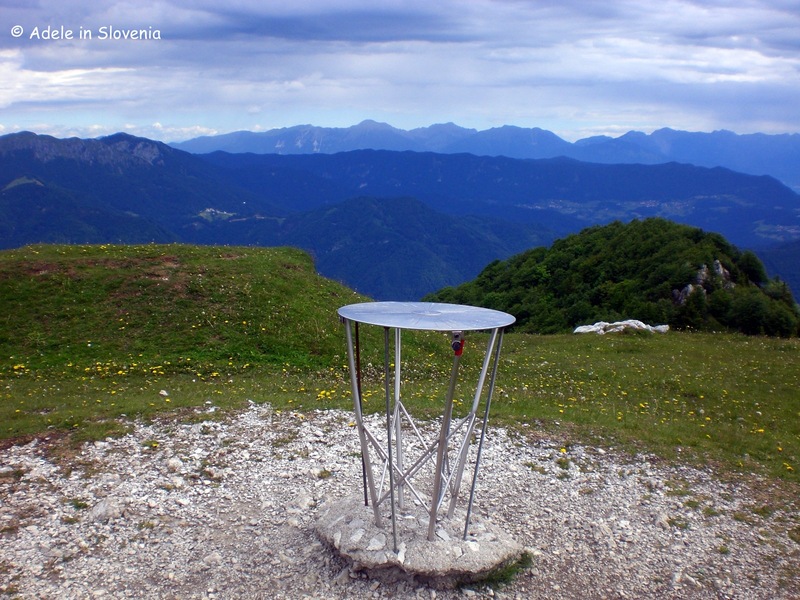 On a clear day, from the hut there are far-reaching views of the Karavanke mountains, the Kamnik-Savinja Alps and the surrounding Škofja Loka hills. 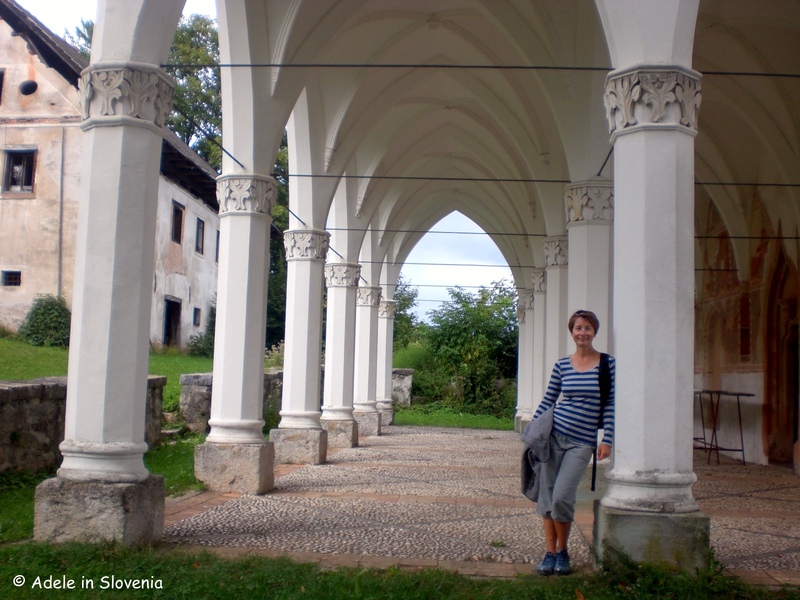 Dom na Lubniku is open year-round; during winter on Fridays, Saturdays, Sundays and public holidays; from the end of April to the end of October daily except Mondays. 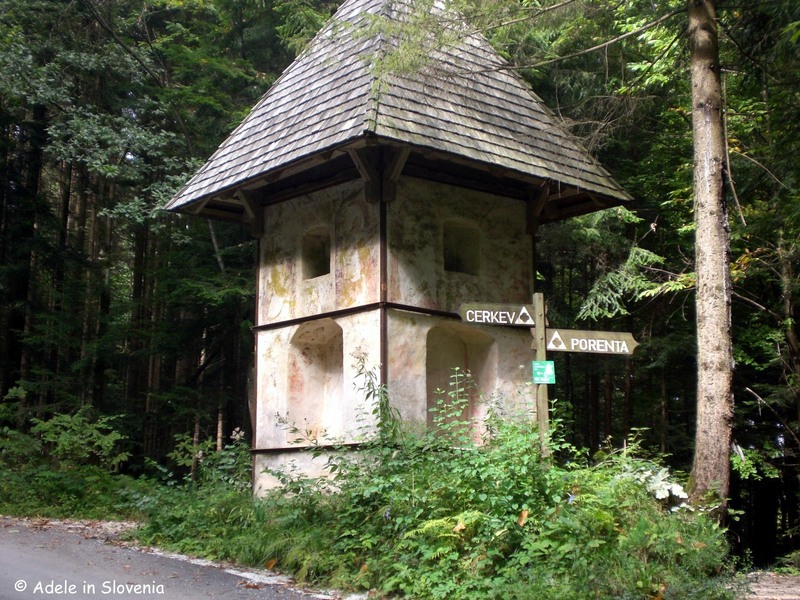 Also in the vicinity of the path to Lubnik is the fascinating Kevderc cave. 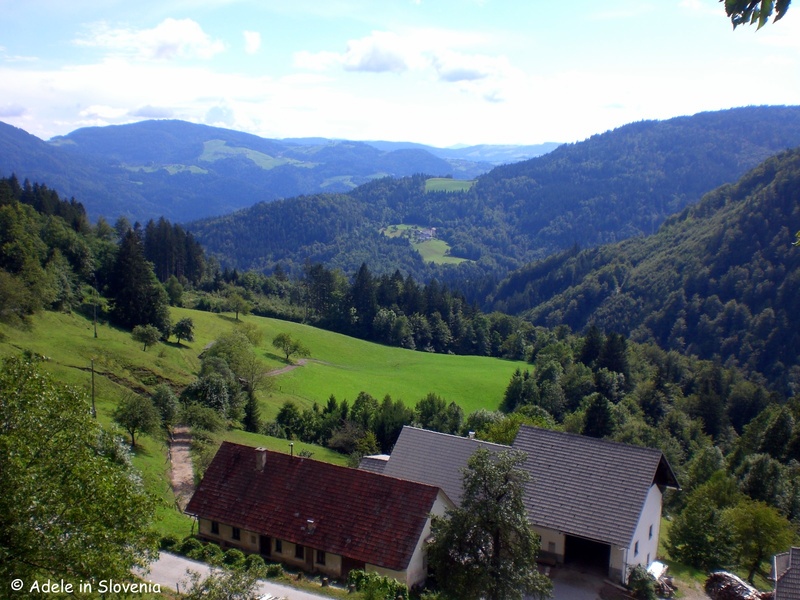 Though nowhere near as well-known as Slovenia’s main tourist caves (Postojna, Škocjan, the Križna cave…), those who take time to visit the Kevderc cave will be captured by its beauty, perhaps even more so as it is so pristine, mysterious, and less-trodden. 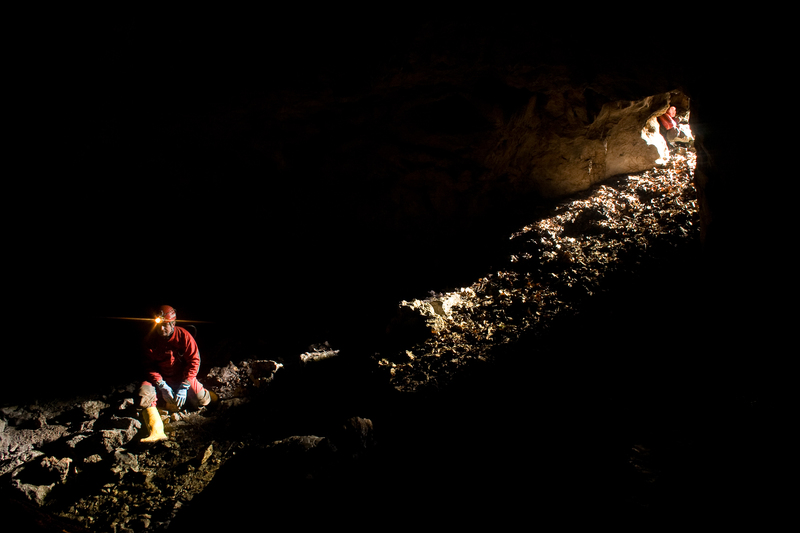 From the entrance to the cave it is just a few metres to the first large hall which passers-by are free to access, providing you have sturdy footwear and a headlamp. 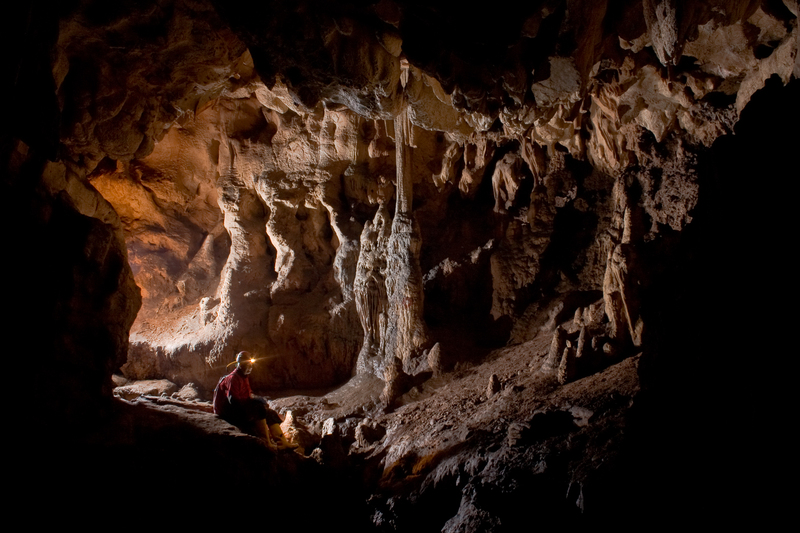 Some sections of the cave, however, can only be explored by experienced cavers. 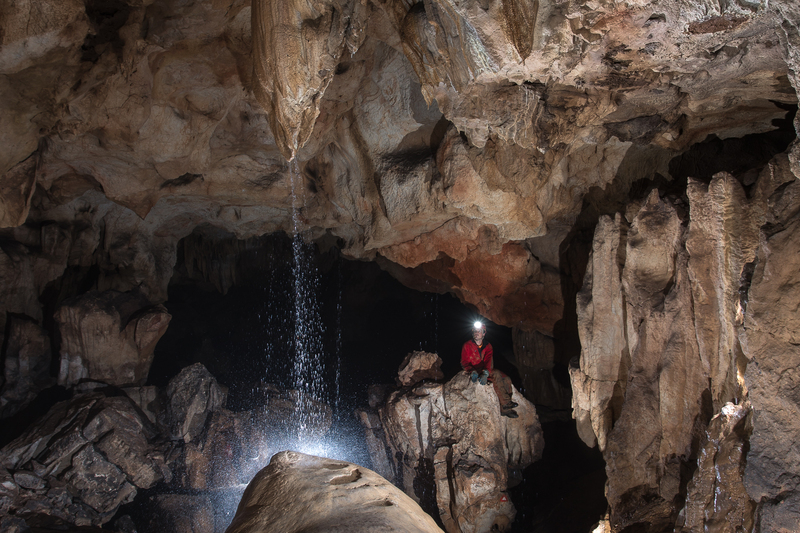 During periods of heavy rainfall, all the water from the surface runs into the cave, creating a unique fairytale-like scene. 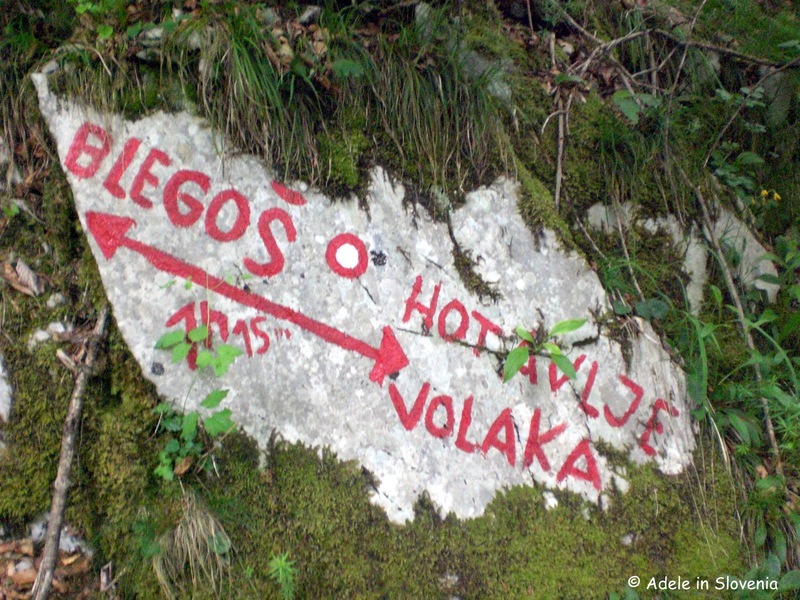 If you would like to explore the cave further, for safety reasons it is recommended that you contact the Škofja Loka Association for Exploring the Underworld (Društvo za raziskovanje podzemlja Škofja Loka) to arrange a guided tour. 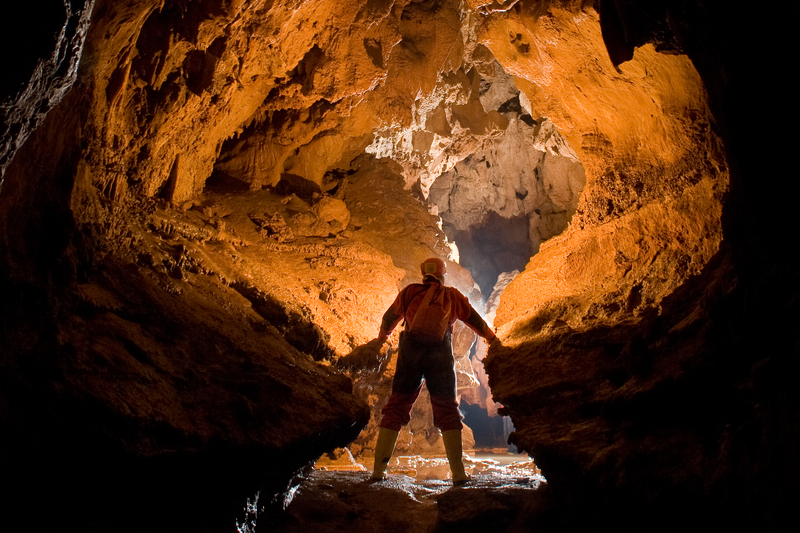 Just a few metres away is the Lubnik cave, which can mostly be explored without a torch as natural light floods into its interior. 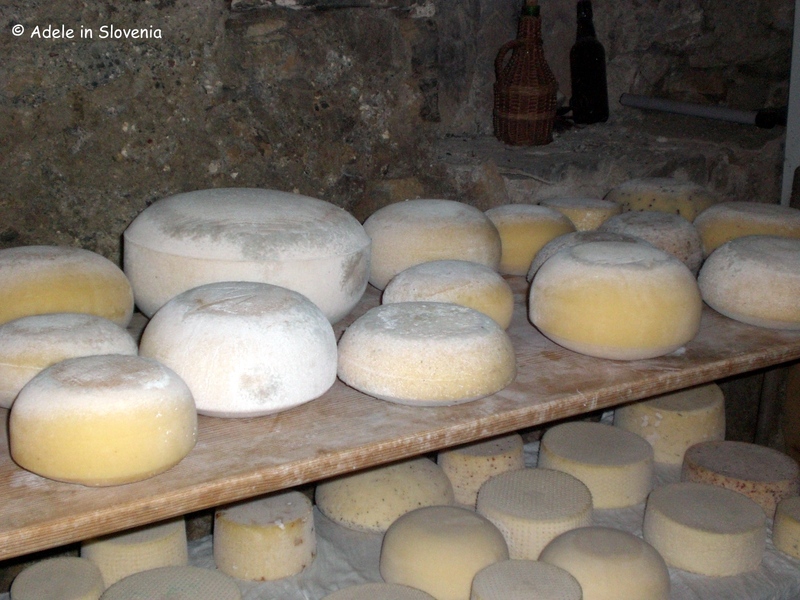 For more information contact DRP Škofja Loka: +386 51 244 244, info@drp-drustvo.si. 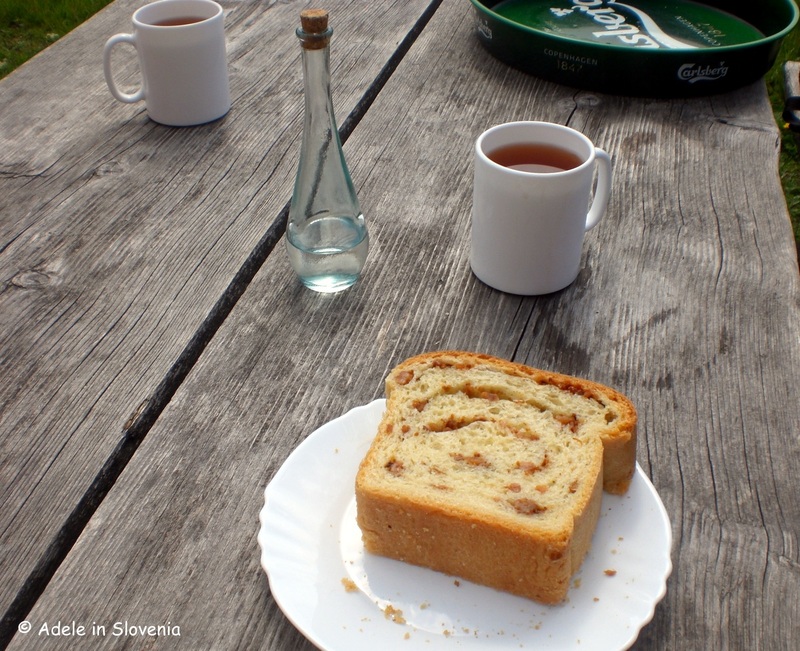 After your hike and/or exploration of the cave, or for those cycling past on the Škofja Loka Cycle Route, I recommend stopping at the Malina snack bar (tel: 041 809 900), which is just metres from the path to Lubnik in Breznica pod Lubnikom, where you can enjoy refreshments with a view! 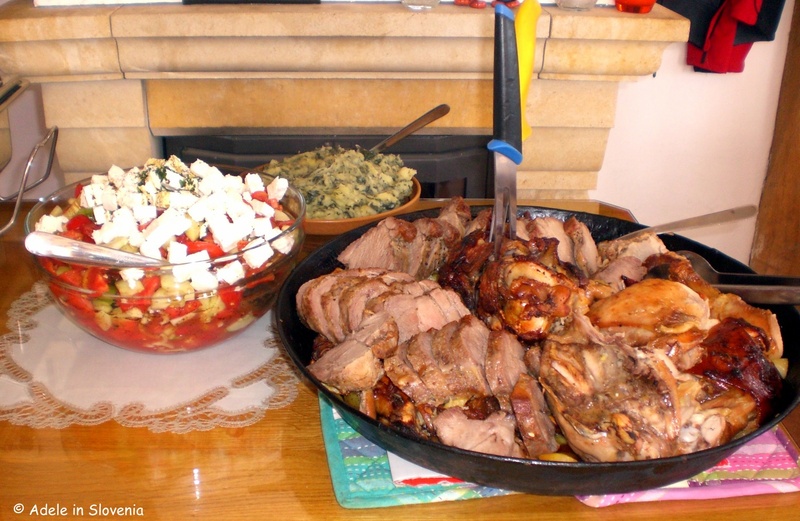 Traditional Gorenjska snacks, soups and stews are always available, and, upon prior arrangement, for special occasions you can enjoy a real feast! 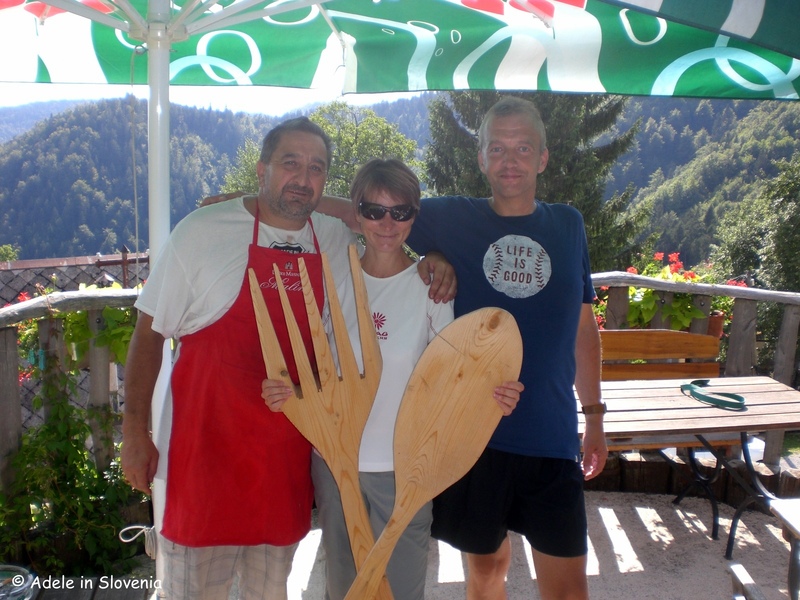 In fine weather the view from the terrace is a winner, but, whatever the weather, you can be sure of a friendly welcome! 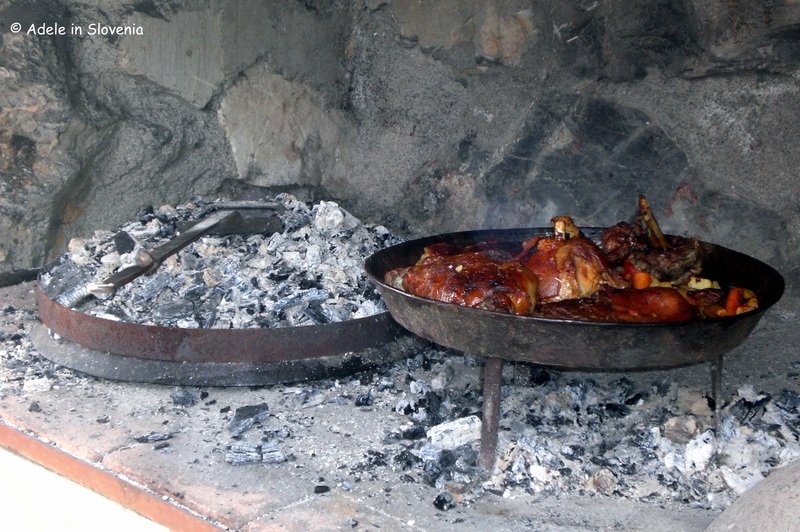 As my visit coincided with a group celebration, I had a chance to see how the food is cooked outdoors over hot coals. 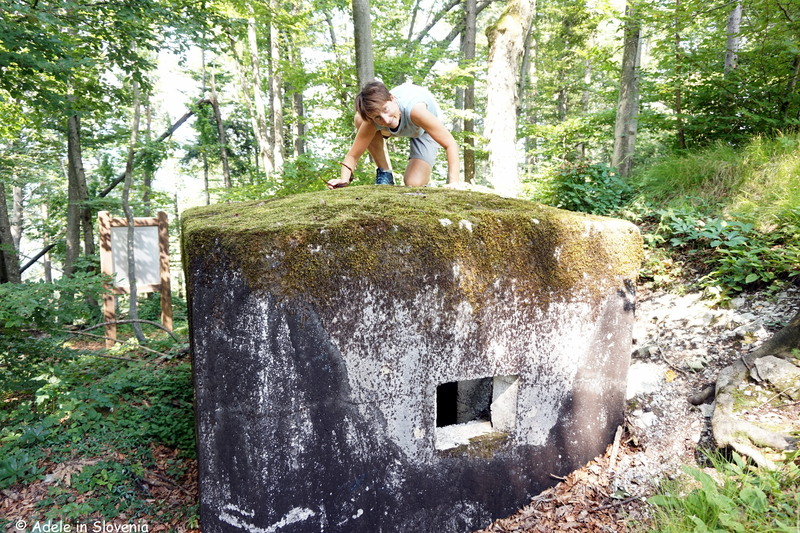 Another day of exploring the scenic Poljane valley; this time walking along part of the former Rupnik Line – a system of fortifications that were built during the 1930’s by the Kingdom of Yugoslavia as a defence line on the border with the Kingdom of Italy. It transpired that the strategically placed forts were never actually used for military or defence purposes, but the building of the fortifications at least brought residents a temporary solution to the unemployment and financial troubles which affected them due to the location of the Rapallo Border. 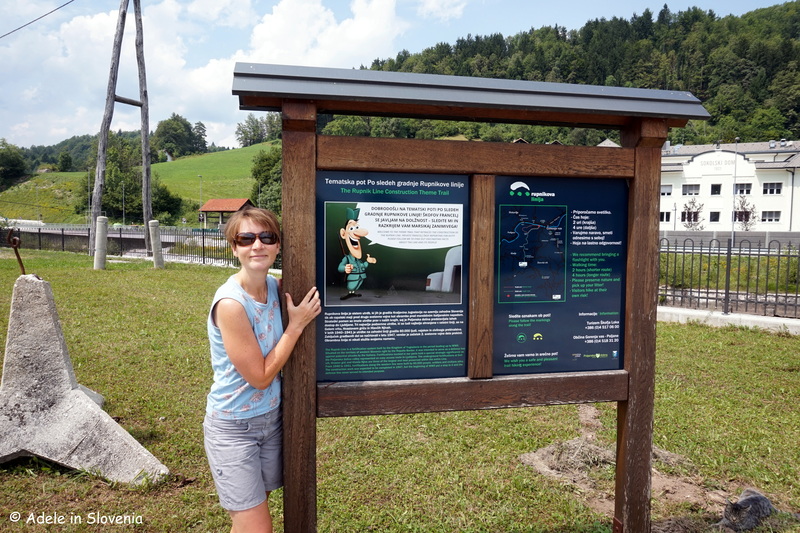 The Rupnik Line theme path begins at the cemetery in Gorenja vas where there is an information board showing the route. The path is well marked; in places with green signs, such as seen below, in other places with yellow markings painted on trees. 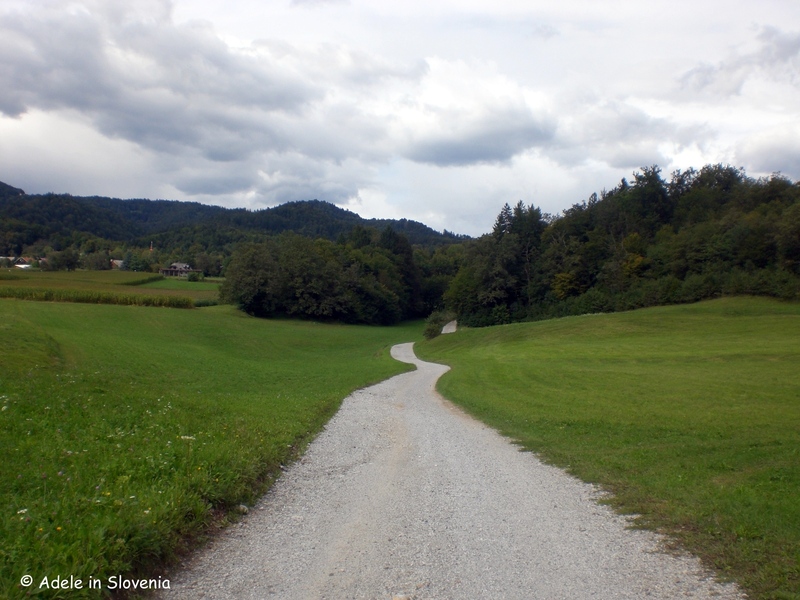 There are actually two paths – a shorter 4.5km circular path and a longer non-circular path which is 6km one-way. However, due to the ever present damage in the forest due to the glaze ice in the winter of 2014 – the clear up job is still ongoing throughout many parts of the country – walking on the longer path is not currently advised. 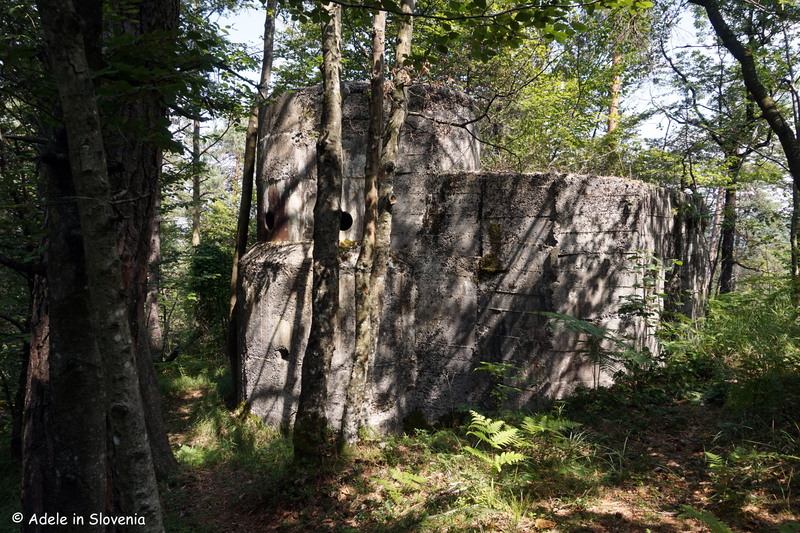 For the first 2km both paths follow the same route, first uphill on an asphalt road, which later becomes an unmade road then into the forest where you soon reach the first bunker. 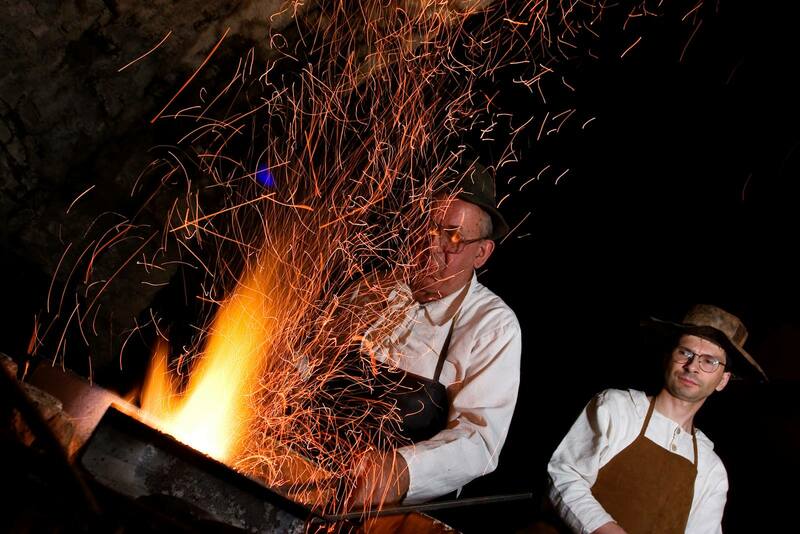 It takes a few minutes for your eyes to adjust to the darkness, but thereafter you can take a look inside. I clearly woke a bat from its slumber and not sure who was more startled, me or it! 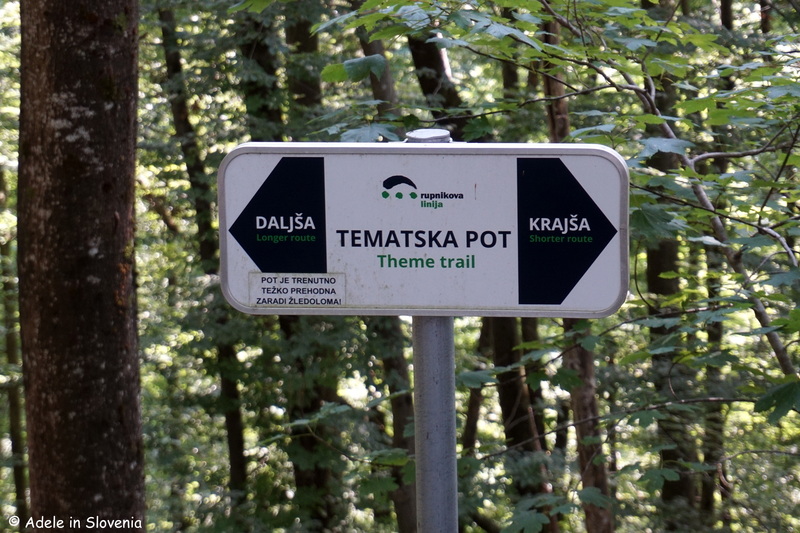 Continue until you reach this sign, where you should take the shorter (krajša) path to the right. 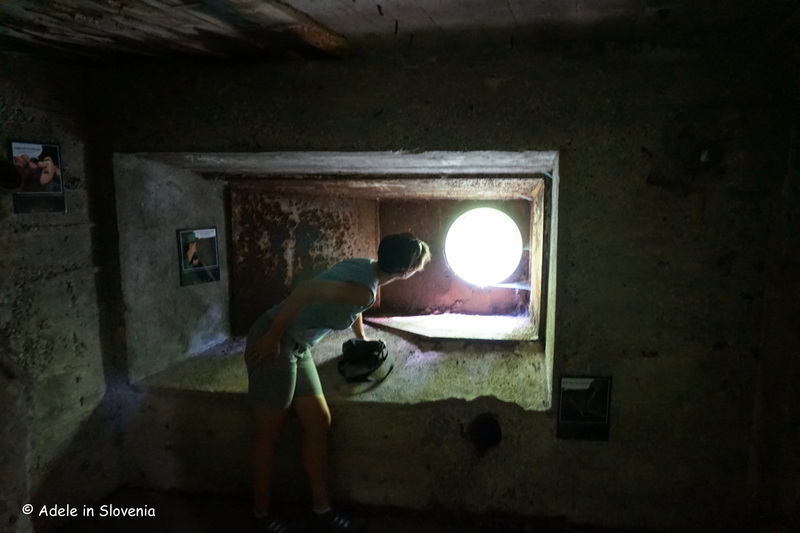 The path continues past more bunkers, each with it’s own information board where you can learn more about the fortifications and take time to explore, but do exercise caution and have sensible, sturdy footwear. 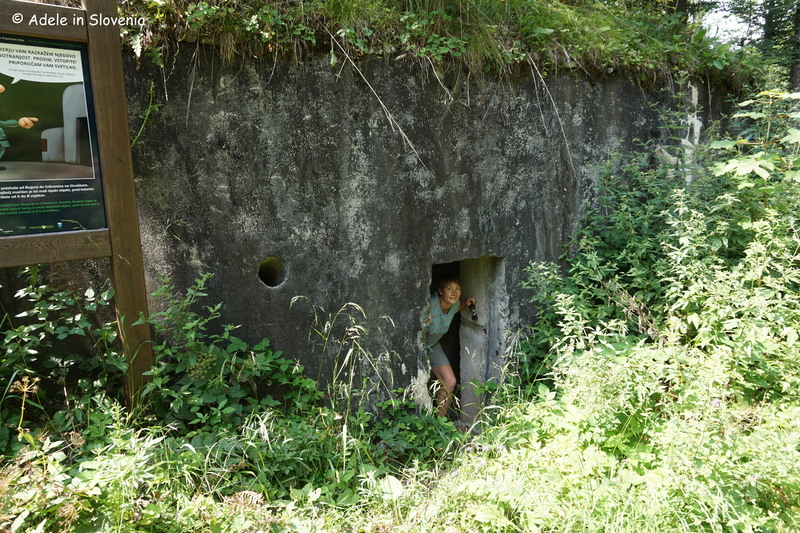 You can enter some of the bunkers, whilst others are not so accessible. 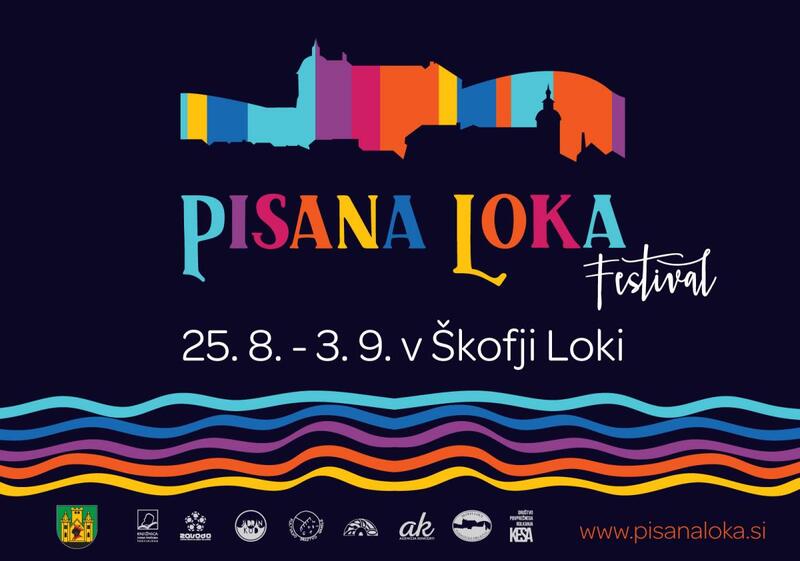 The annual Pisana Loka Festival (Colourful Loka) takes place this year in Škofja Loka from 25th August – 3rd September. 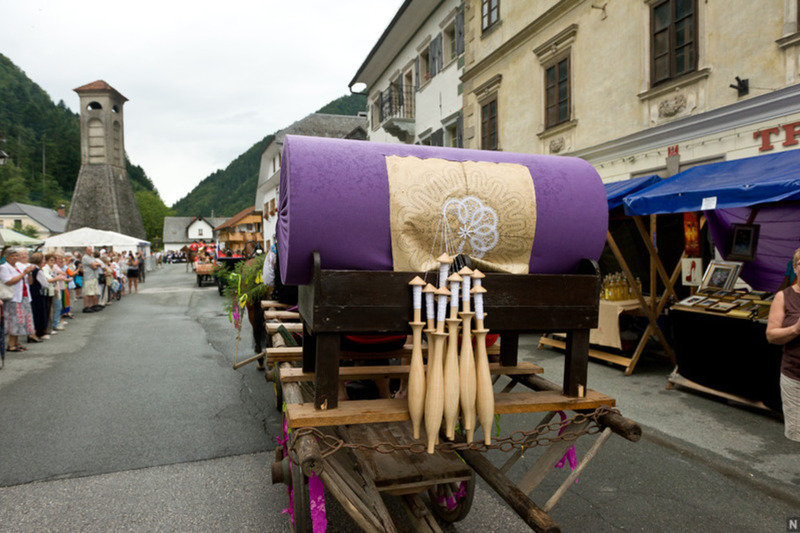 The festival is a mixture of concerts, workshops and performances – many of which are FREE – that take place at various locations, including in the heart of the old town centre and at Loka Castle. 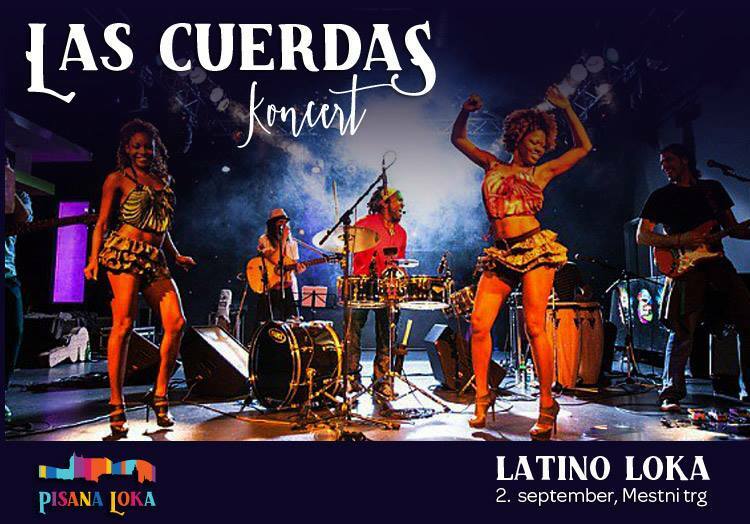 This year part of the festival will be dedicated to Latino Loka on 2nd September in the Town Square (Mestni trg), and promises to be sizzling! 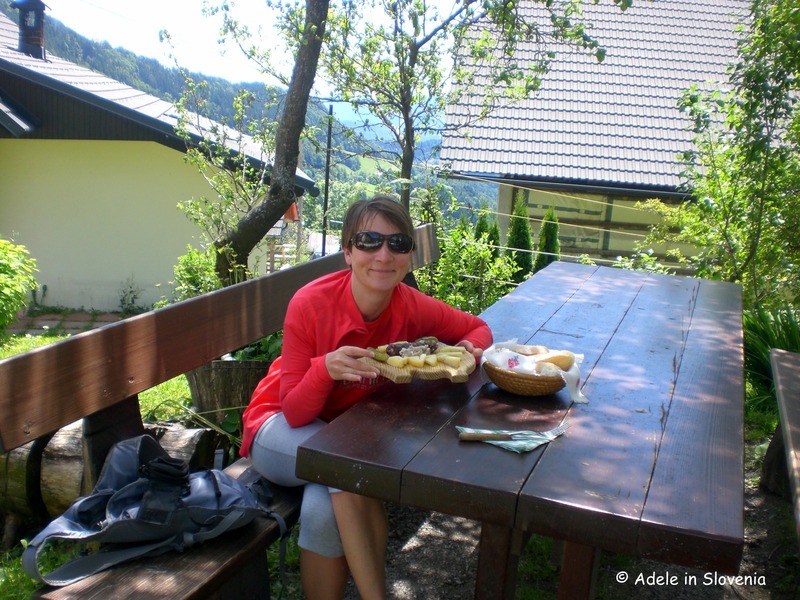 Hike Blegoš and Dine at Pr’ Andrejon – A Winning Combination! 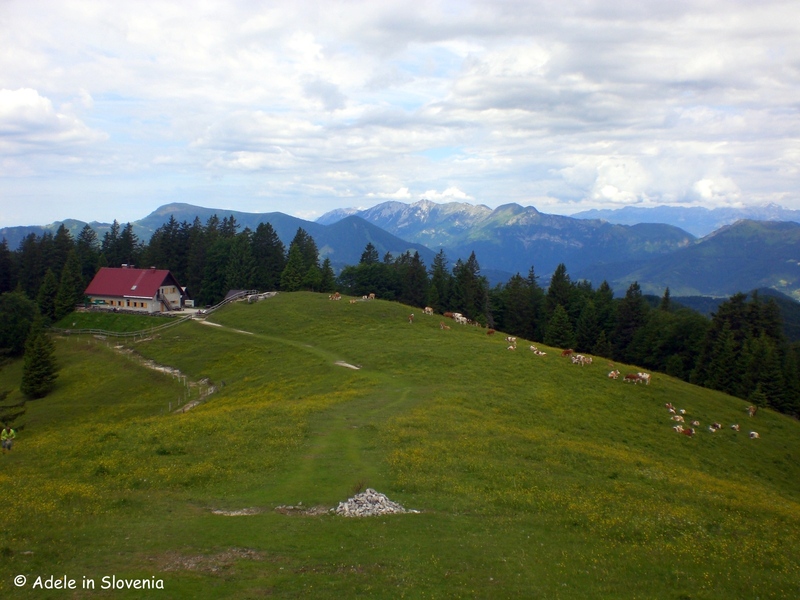 At 1562m Blegoš is among the highest of the peaks surrounding Škofja Loka and, together with the Koca na Blegošu mountain hut, is one of the area’s favourite destinations for lovers of hiking and nature. 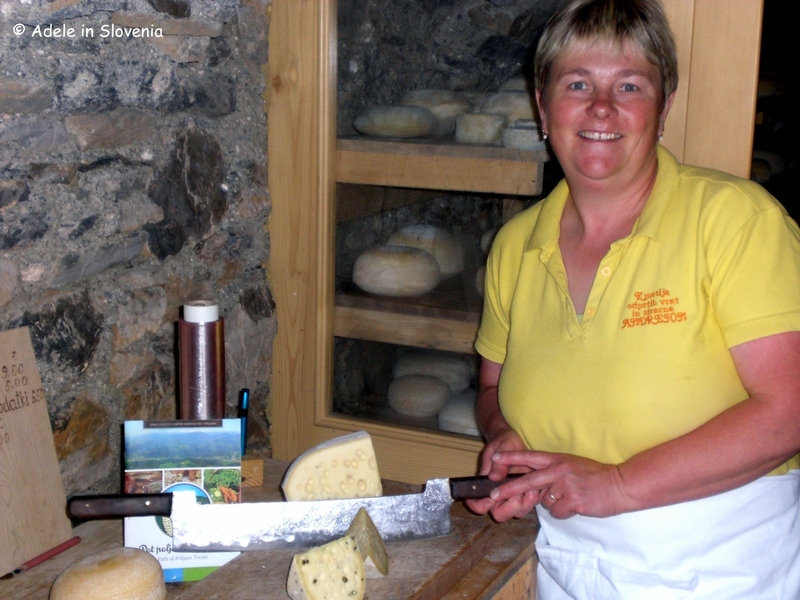 Blegoš can be reached from many directions, but whichever you choose, I recommend that you also take time to visit the Pr’ Andrejon Open Door Farm, where you can buy home-produced cheese and reward yourself with some fantastic, traditional, home-cooked Slovene food. 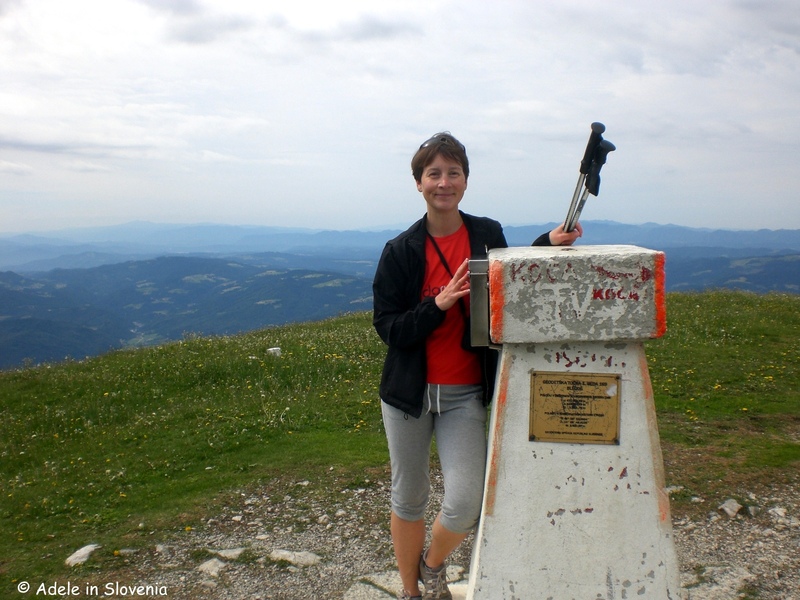 If you would like to take the shortest route to the peak, and the one which puts you in easiest reach of the Pri Andrejon farm, then you should begin your hike from Črni Kal, from where it only takes around an hour to the top of Blegoš. I, however – not being prone to ever taking the ‘shortest’ or ‘easiest’ way! 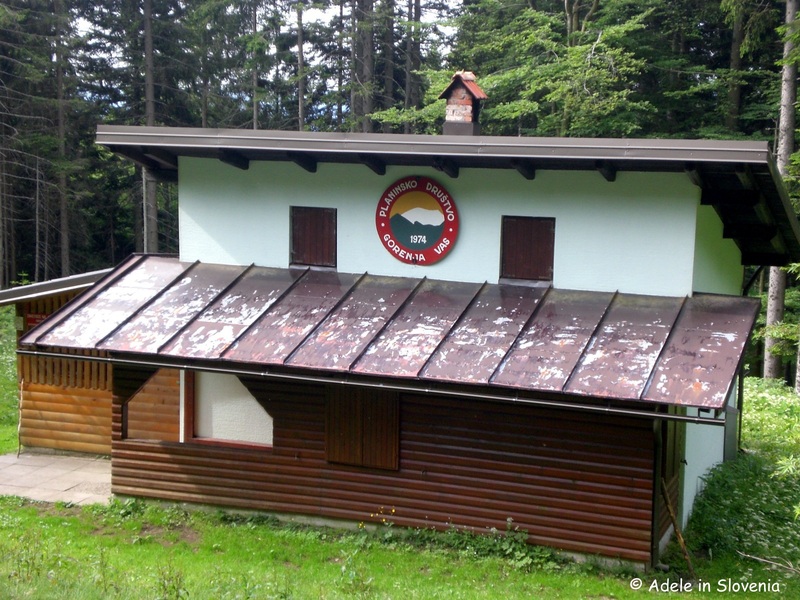 – opted to take the route from the hamlet of Volaka which leads past the Mountain Guards’ Shelter on Jelenci (Planinski zavetišče na Jelencih), which, rather oddly, is only open at weekends during winter. 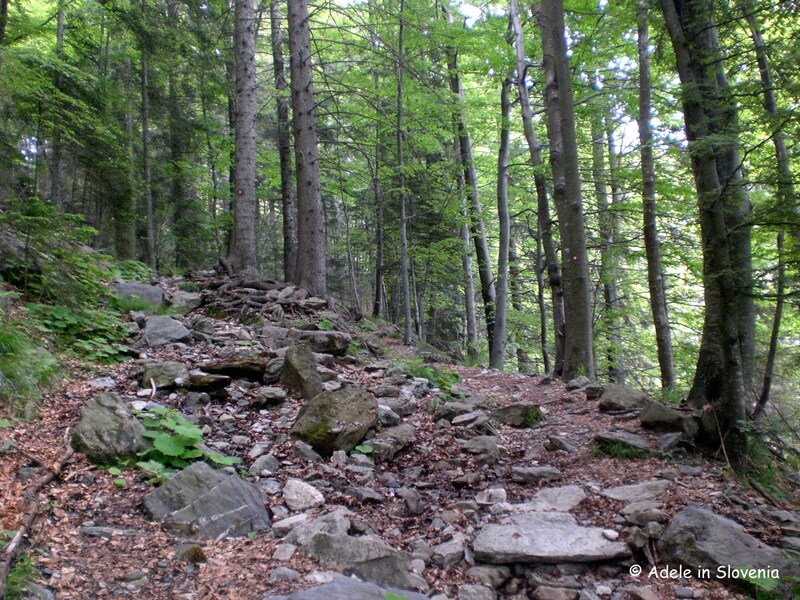 The path, which leads up through the forest, is never overly steep but at the same time is challenging enough to work up a sweat! 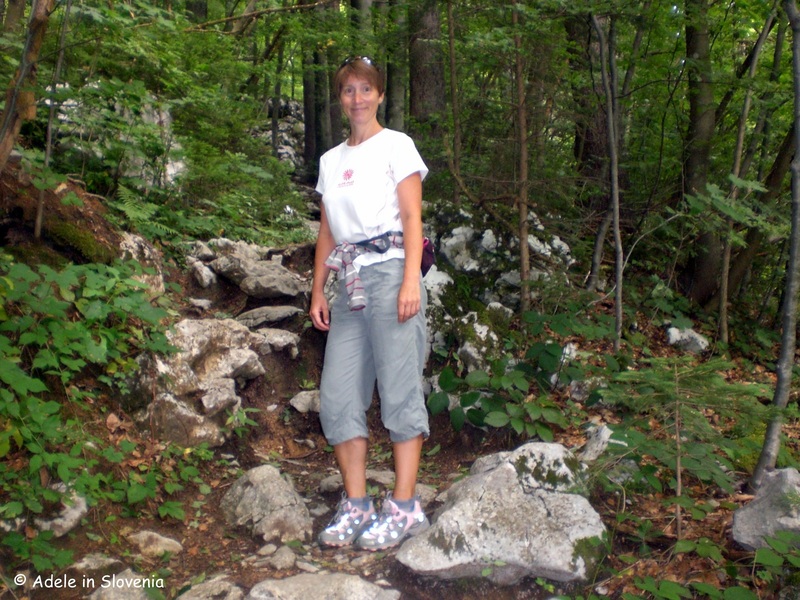 The path is very well marked; at times the usual red circle with a white inner is on rocks and/or trees, at other times there are more prominent markings. 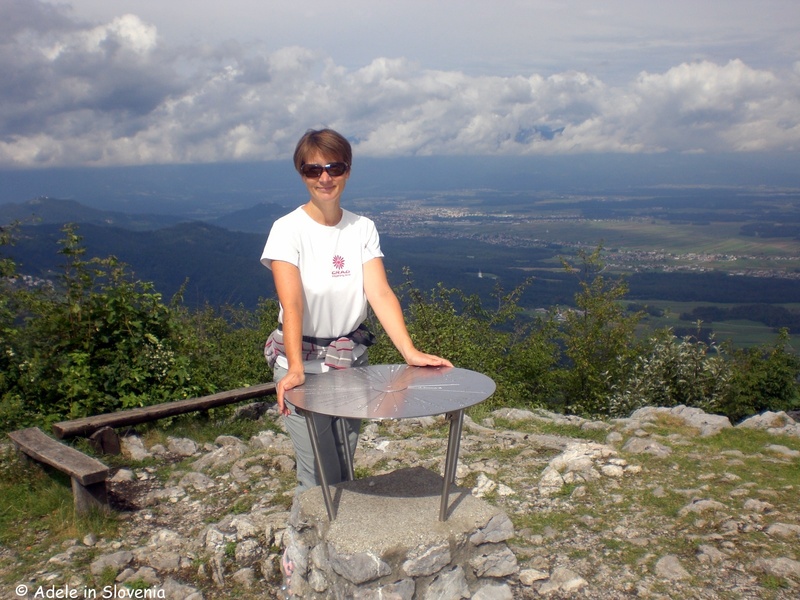 It took me exactly 2 hours to reach the summit, having first passed the mountain hut, where I didn’t pause on the way up, but did stop briefly on the way back down to check out their legendary ocvirkova -a kind of savoury potica made using pork crackling. Although it was one of those mornings when the weather couldn’t quite make up it’s mind, the views were still stunning, and in fact perhaps even more so for the dramatic cloud cover. 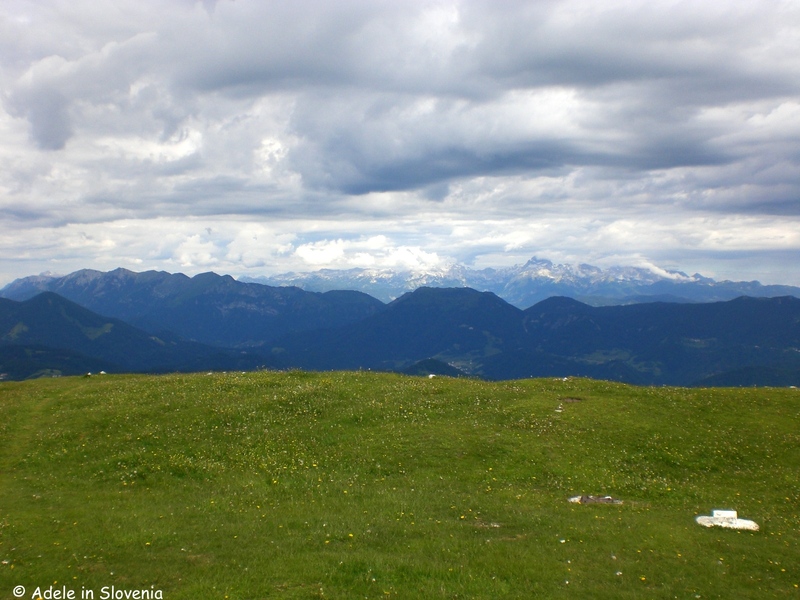 Despite the cloud, it was still hard to choose where to look first, such were the panoramic views. 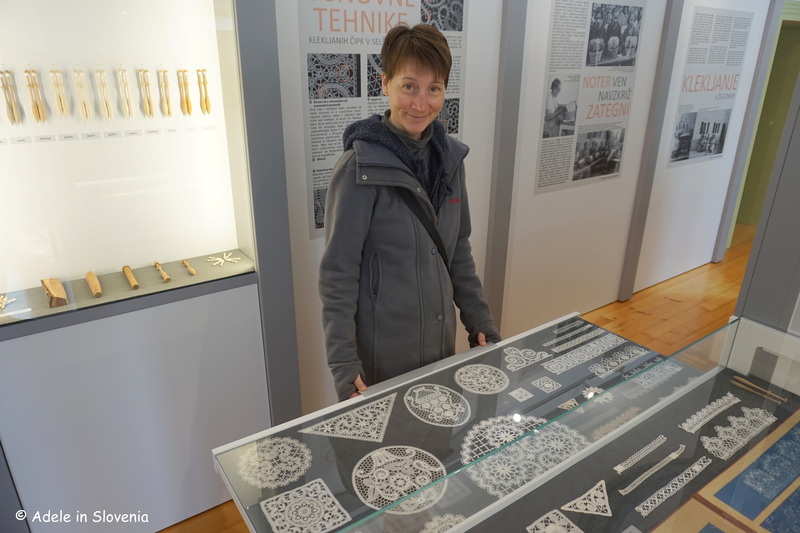 An orientation table assists with getting one’s bearings. 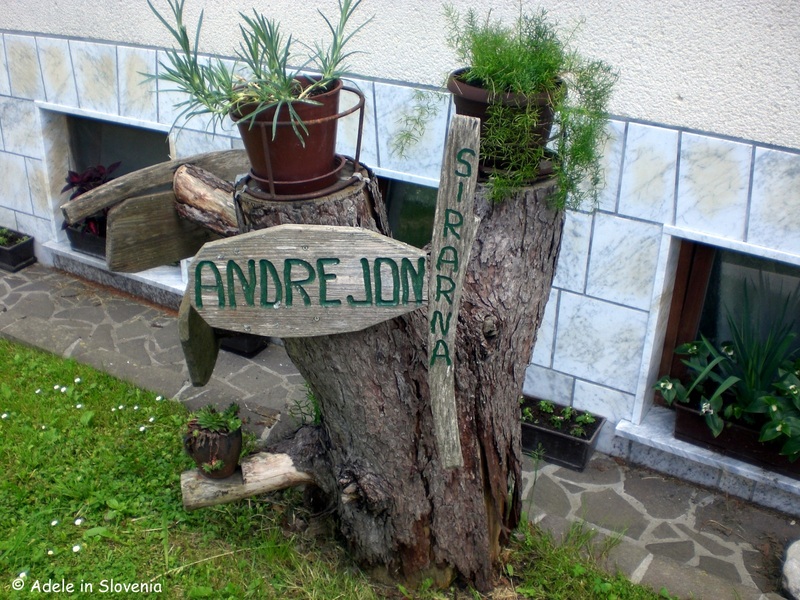 Although not the easiest of places to reach, a narrow winding road that seems to go on and on… when you do eventually reach the Pr’ Andrejon farm in the hamlet of Gorenja Žetina above the Poljane valley, the warm welcome and excellent food means all is soon forgotten! Whilst it is not a tourist farm, i.e. 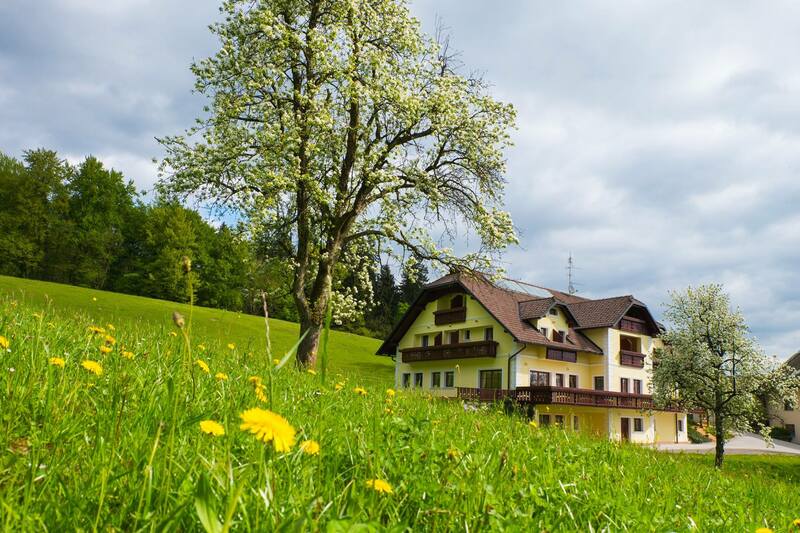 there are no rooms available for overnight accommodation, they consider themselves an ‘Open Door Farm’, meaning, as the name implies, they are pretty much always open. However, despite its relatively remote location, this place is hugely popular, so advanced booking, particularly for large groups, is a must. Despite my arrival coinciding with that of 2 large pre-booked groups (hence, heed my advice to book in advance! 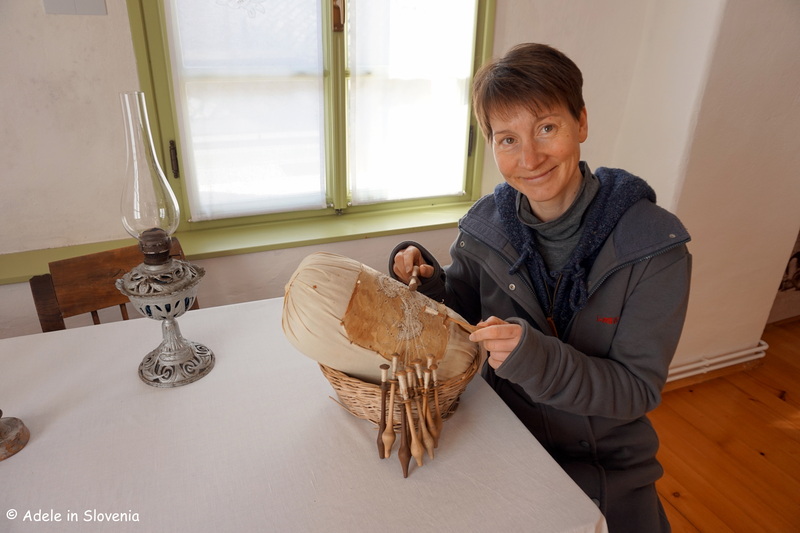 ), Anka still managed to rustle up some home-produced cheese and cold cuts and the most amazing bread, fresh from the wood-burning oven. 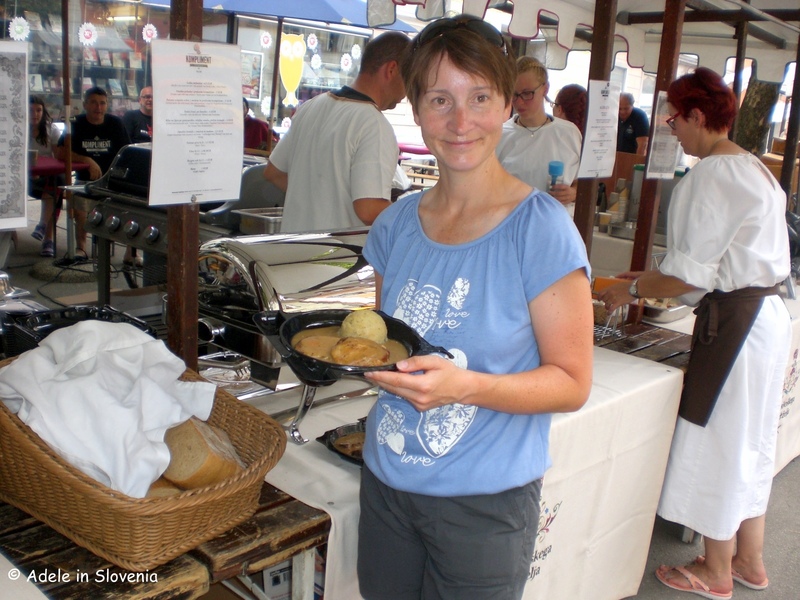 I’d travel a long way for bread that good – oh yes, I actually did – so I had to get some to take home too! 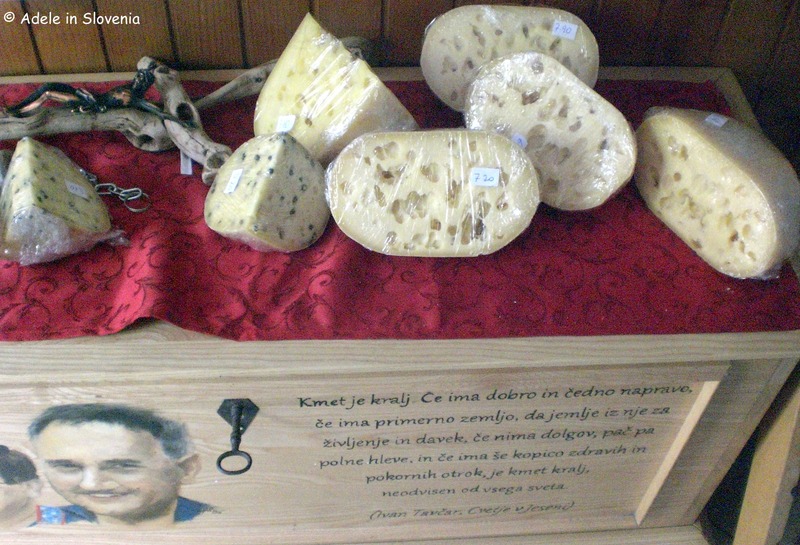 During my brief visit, I was amazed at how many people stopped by to buy cheese direct from the farm. 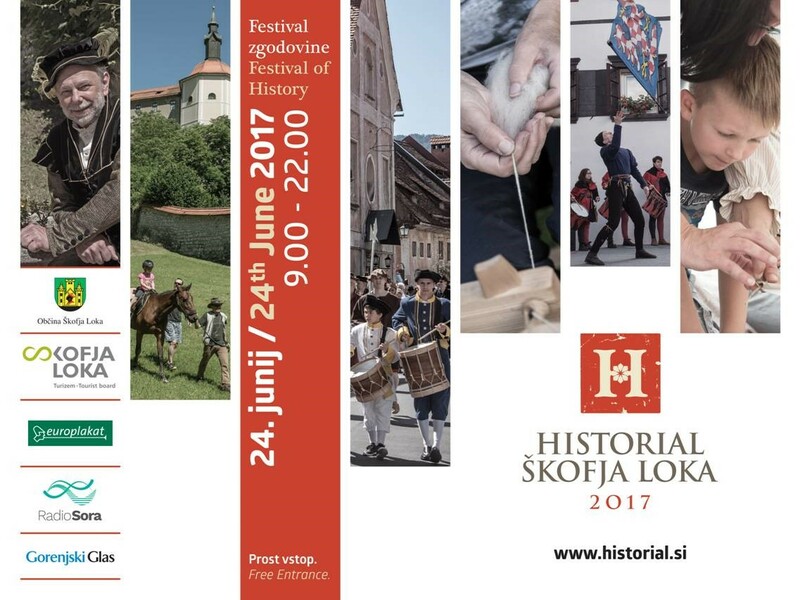 The annual Škofja Loka Historial (Festival of History) took place last weekend in the well-preserved medieval old town and its surroundings. I attended the festival and managed to dodge (most of !) the afternoon showers which are so often a feature at this time of year. 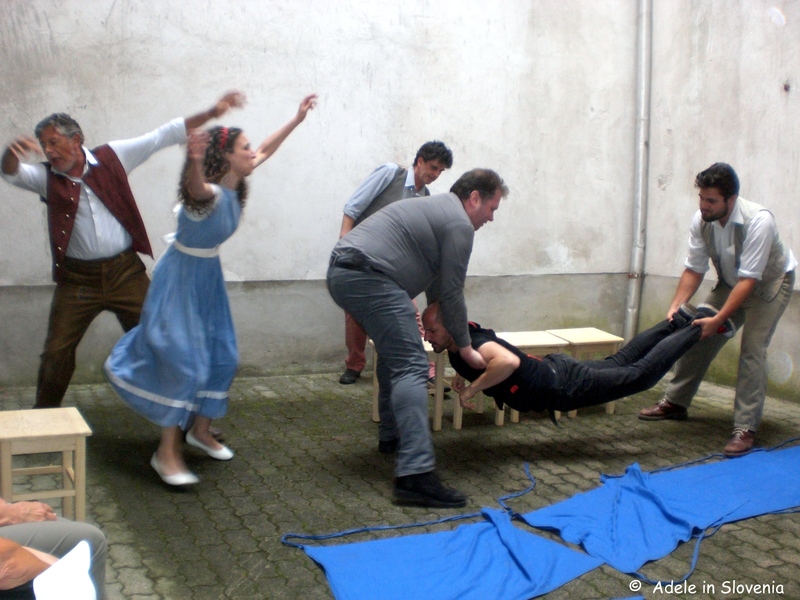 And the spirits of all the dancers, actors, stallholders, and other performers and guests weren’t dampened either! 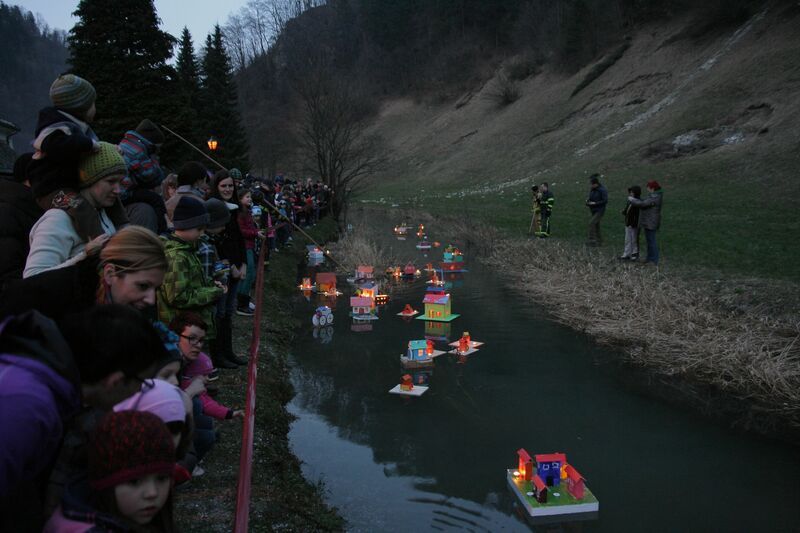 Below you can see some of the highlights of the festival, as well as see more of this charming town on the Sora river which should be on your list of places to visit whilst in Slovenia. 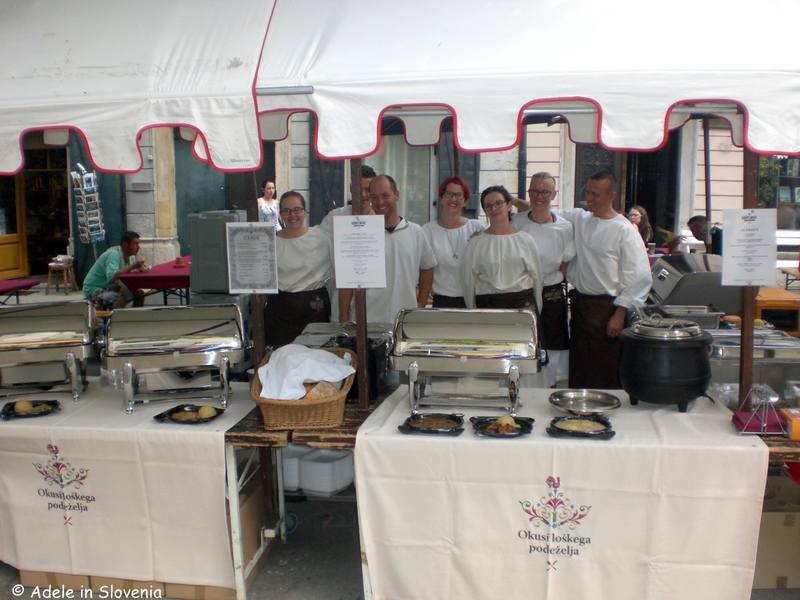 The fair and the majority of events took place in the main town square (Mestni trg) where visitors had a chance to try some typical dishes from the area, part of the Taste of the Škofja Loka Countryside project (Okusi loškega podeželja). 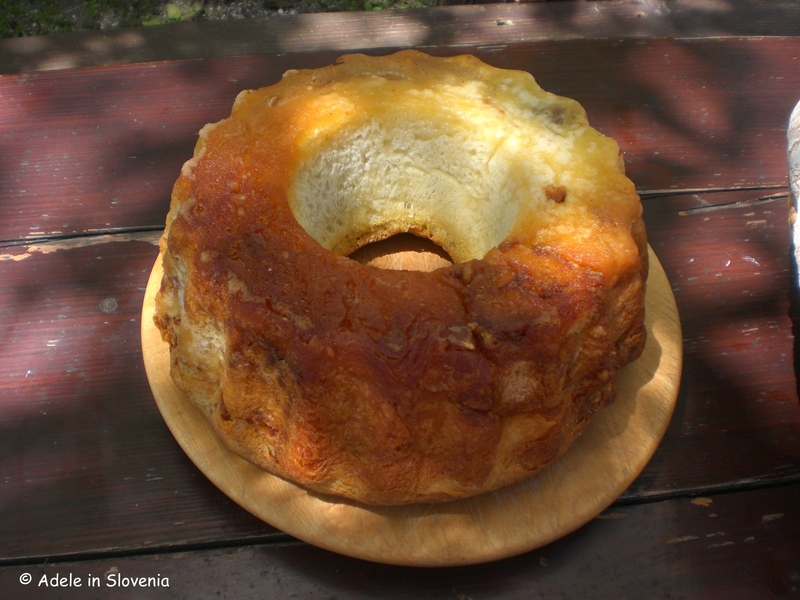 One of the foods most synonymous with this area is Visoška pečenka – roast pork from nearby Visoko, studded with carrots, lemon, parsley garlic and laurel. 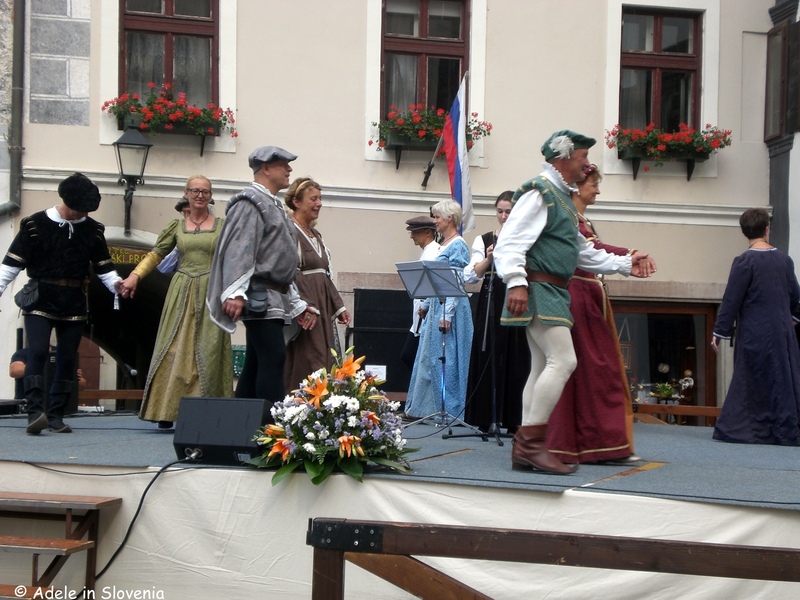 On the main stage there were performances from, amongst others, the Lonca Dance Society performing historic dances. 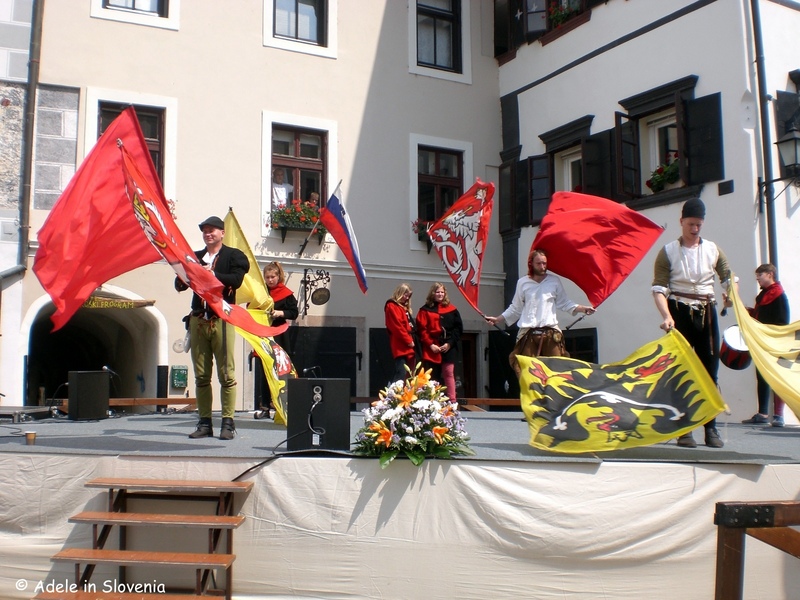 A display of flag throwing and sword play was performed by the Taboršti Kupci historic group from the twin town of Tabor in Southern Bohemia. They certainly weren’t just play fighting! 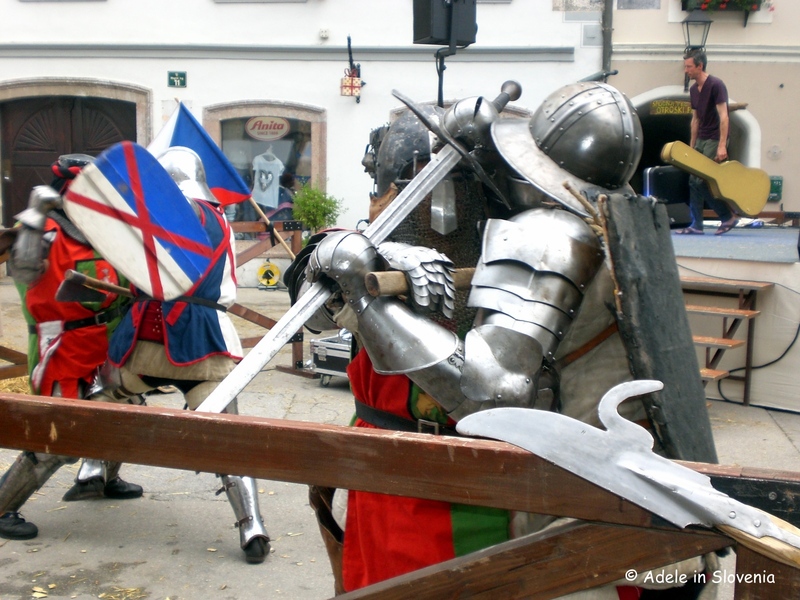 It was pretty brutal, raw fighting which, in addition to swordplay, seemed to involve a lot of bashing each other over the head with (real!) hammers! 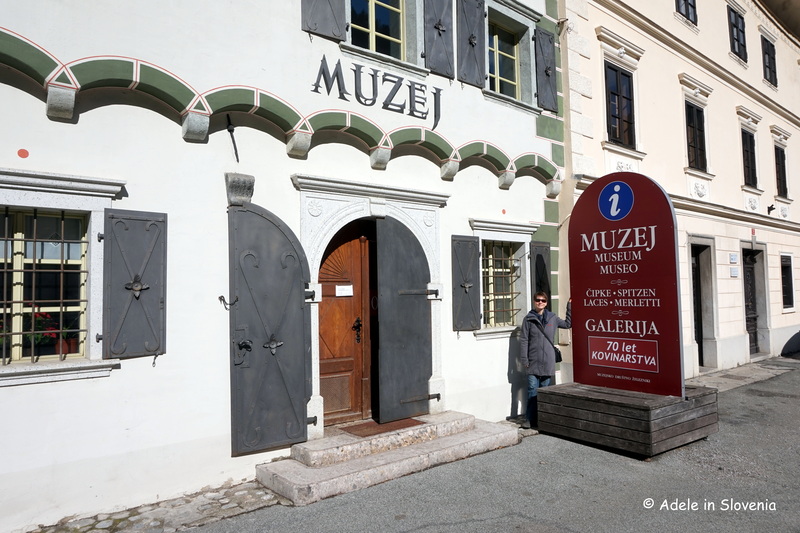 In Rotovž, the former town hall building and one of the most prominent buildings in the square with its baroque frescoes and three-storey gothic arcaded courtyard, the main event took place at intervals throughout the day. 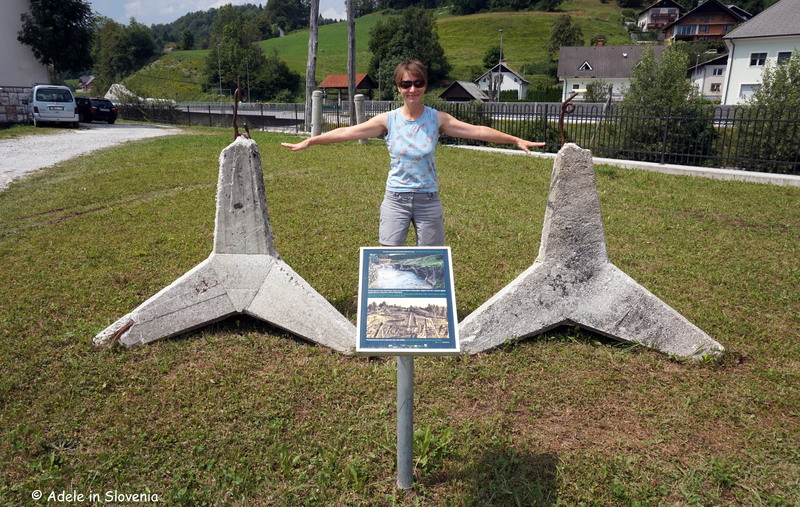 The drama ‘The Devil’s Footbridge’ (Hudičev brv) tells the story of the devil, the Puštal frogmen and a stone bridge. 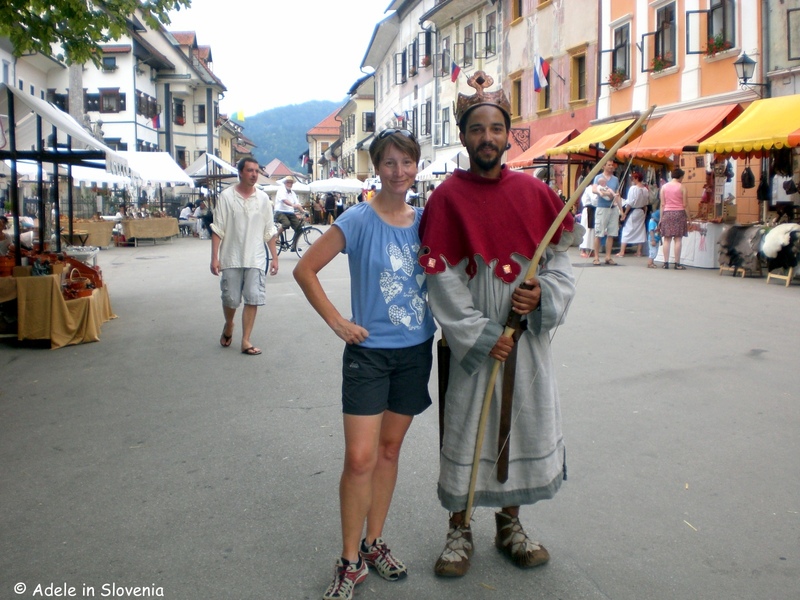 From the main square, I headed down through the narrow streets and alleys to the other main town square, Lower Square (Spodnji trg) where there were also various workshops and performances. 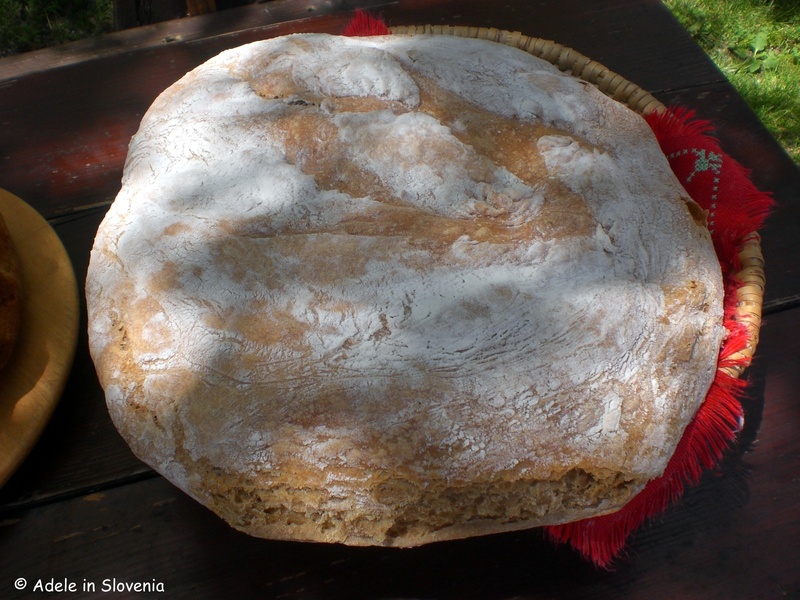 Next it was up to Loka Castle and the 16th century Škopar’s House (Škoparjeva hisa) where I had a chance to sample Loška medla, cooked in the original black kitchen; a simple peasant-style dish made of cooked millet which, according to some sources, originates from the Škofja Loka area. 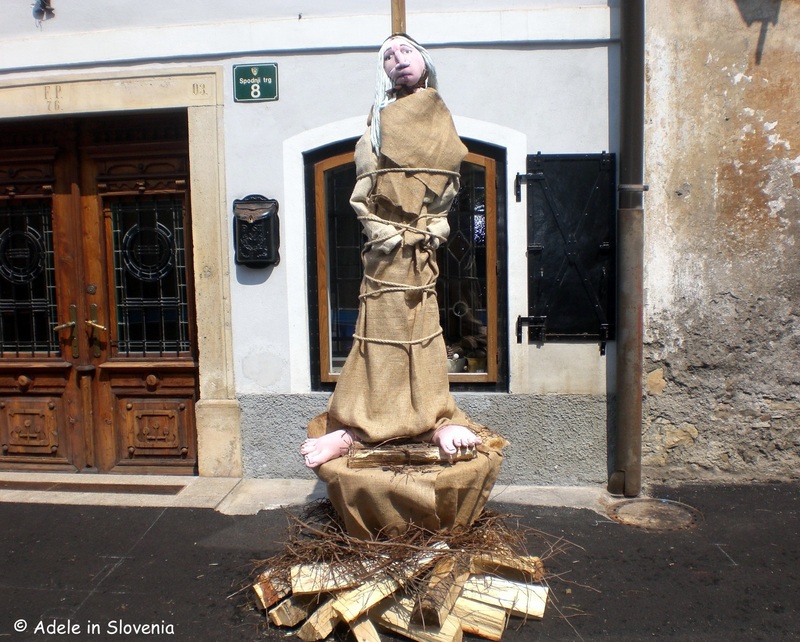 Outside the house there were workshops and puppet shows for children, as well as weaving workshops. Unfortunately I haven’t got so much as a creative bone in my body when it comes to such things, but I’m always willing to give them a try! 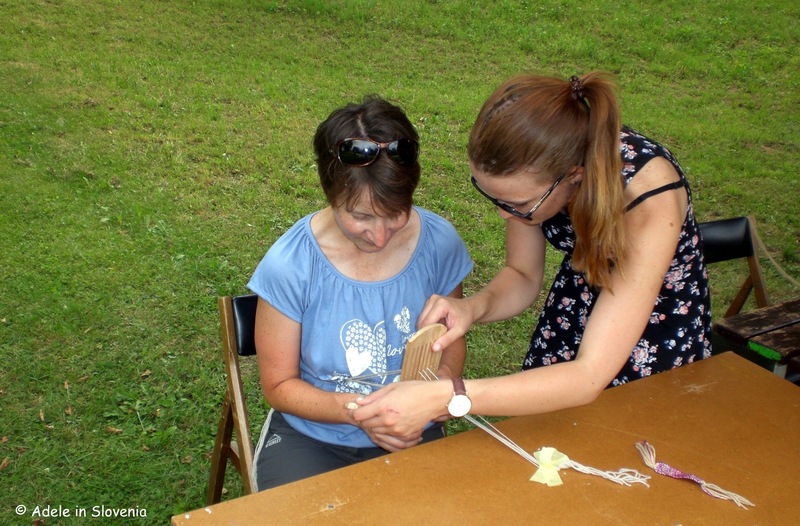 Weaving on a loom and using a weaving board; the latter, as I discovered, also requires a fair bit of patience! 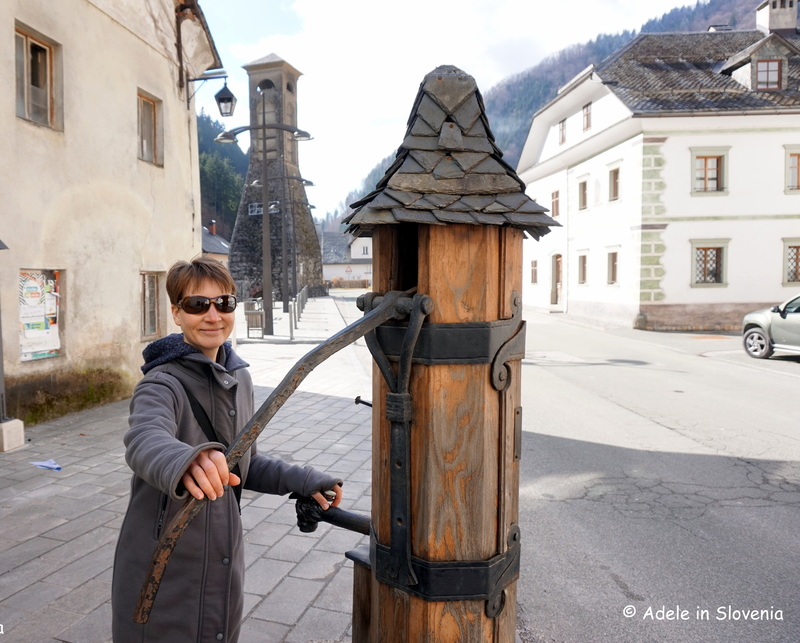 Even when there aren’t any particular events happening in the town itself, there’s no shortage of things to see and do in and around it, as well as further afield in the Selca and Poljana valleys, about which I’ve already written quite a bit this year, but I’m certainly not finished yet! 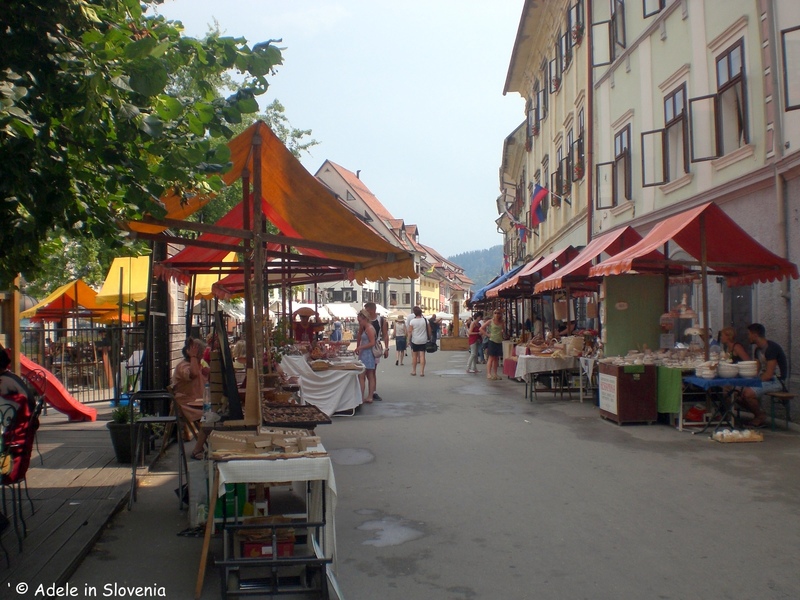 I’m really enjoying getting to better know the Škofja Loka area this year. 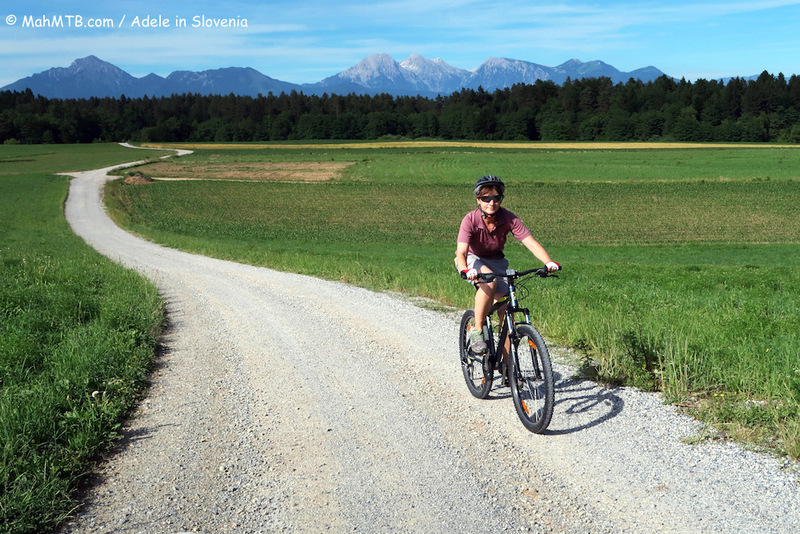 So far I’ve done most of my discovering on foot, so this time I set off by bike to discover part of the Škofja Loka Cycle Route. 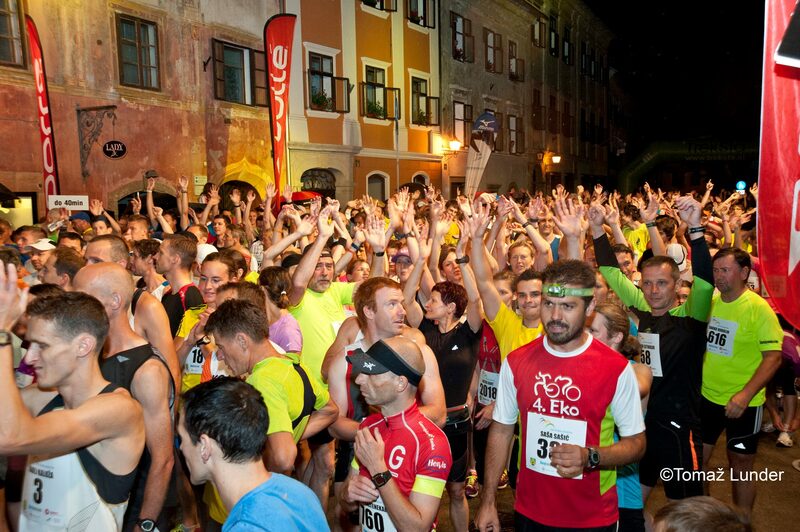 The route is divided into 13 sections and covers a total area of 390km. 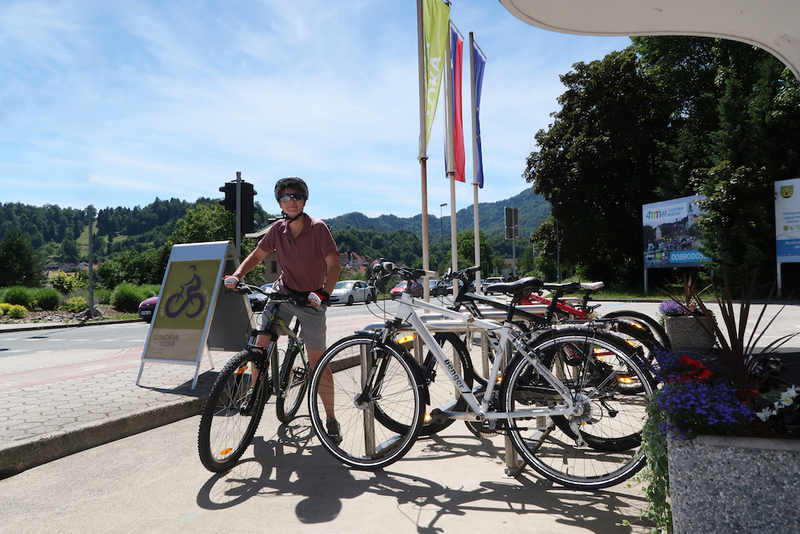 There is something to suit all levels and kinds of cyclist; some of the routes are shorter and easier, others longer and more demanding. 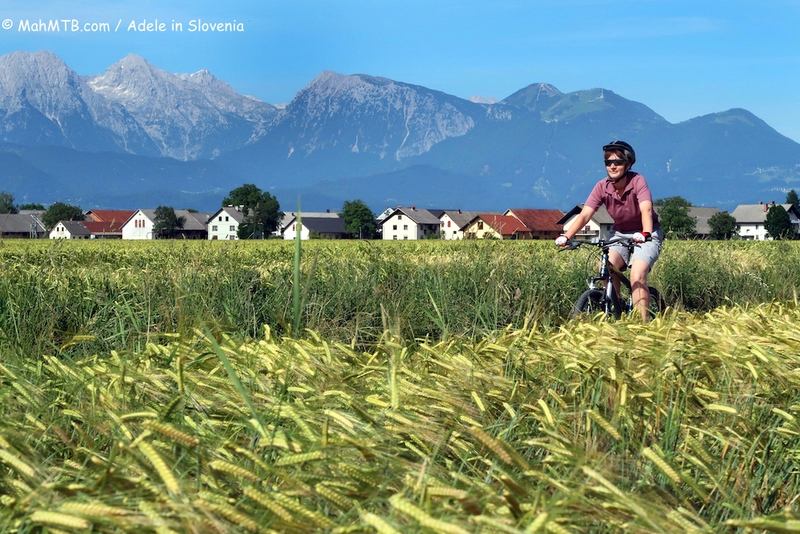 You can rest assured that whichever route you take, you will cycle through unspoilt nature, past numerous sights of interest, soak up the great views, enjoy fresh, clean air, and take a breather for refreshments at tourist farms and other refreshment stops. The hardest part is deciding which of the great routes to take! 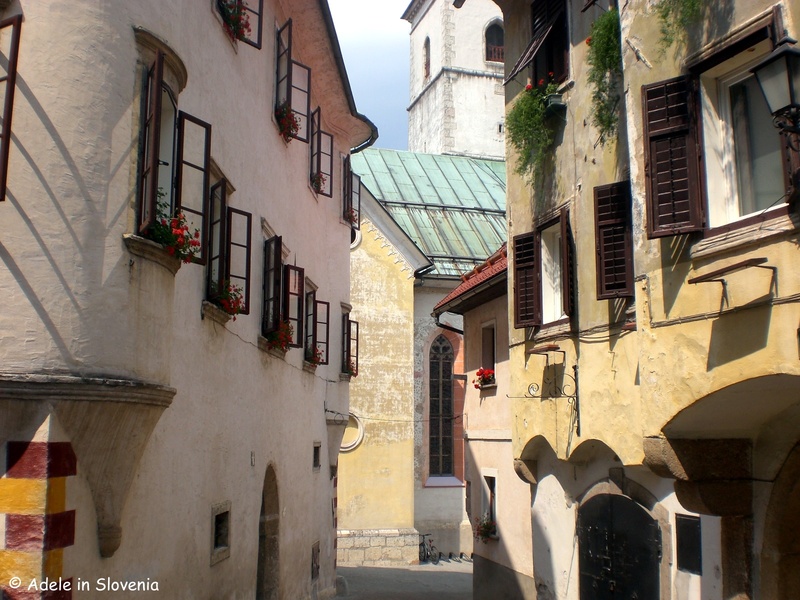 A ride through the historic old town centre is the obvious place to start, and a must! 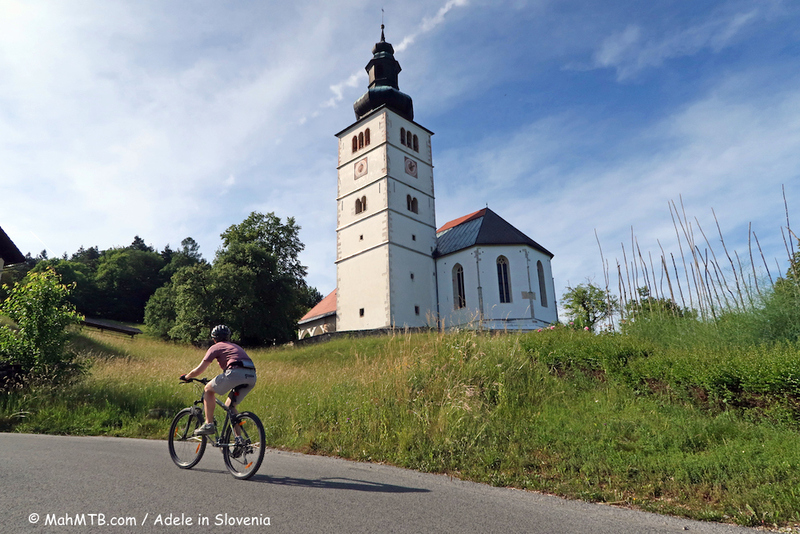 If you plan to cycle multiple sections of the route, your first port of call should be the Škofja Loka Tourist Information Centre, where you can pick up a map and a card on which you can collect stamps at the various control points along the route. 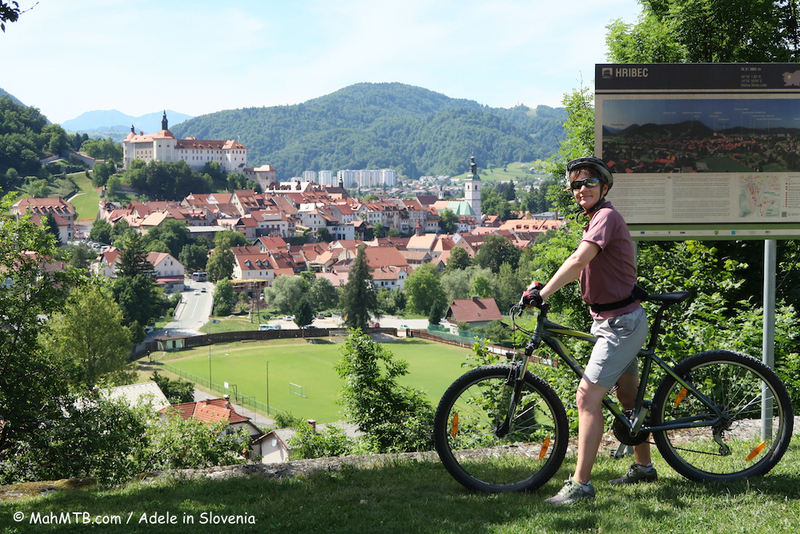 Bikes can also be hired at the centre, trekking or mountain bikes, and decent ones too – mine was a Scott! 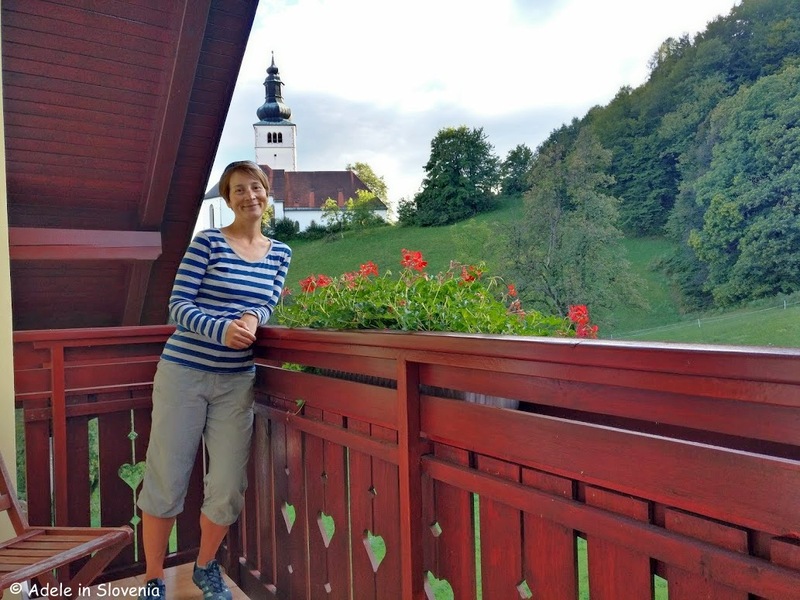 With only a few hours available for our trip, we agreed on taking some of the routes around the outskirts of the town, through Puštal, across the Sorica fields and to Crngrob. 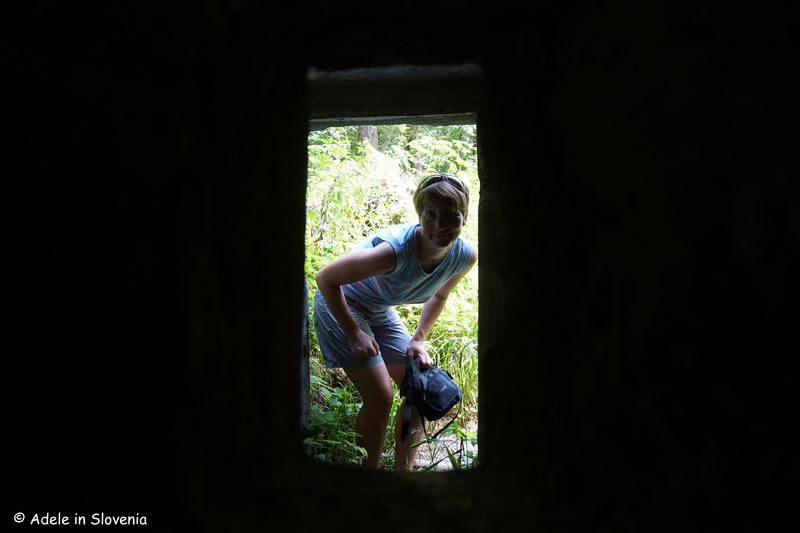 One of the highlights was seeing Škofja Loka Castle from an entirely different perspective – from Hribec, part of the Path to Puštal. Stunning, I’m sure you’ll agree! 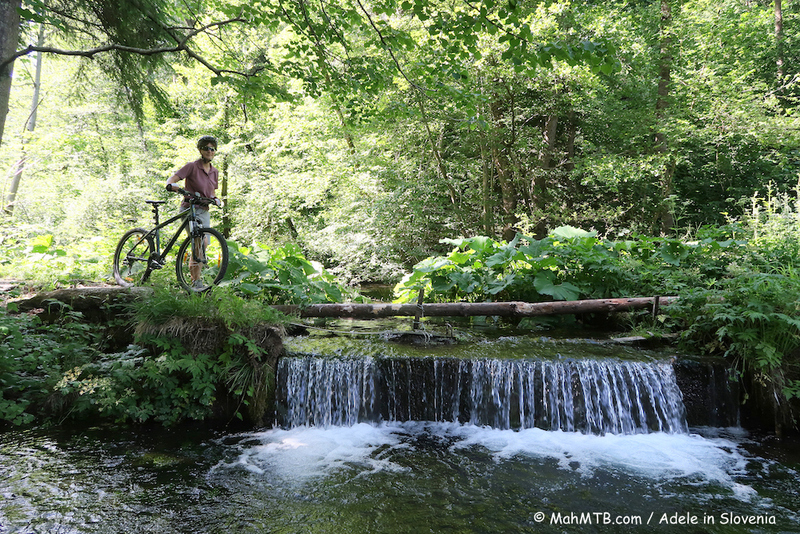 We crossed fields, meadows and pastures, and Matej led me to hidden beauty spots in the cool of the forest. 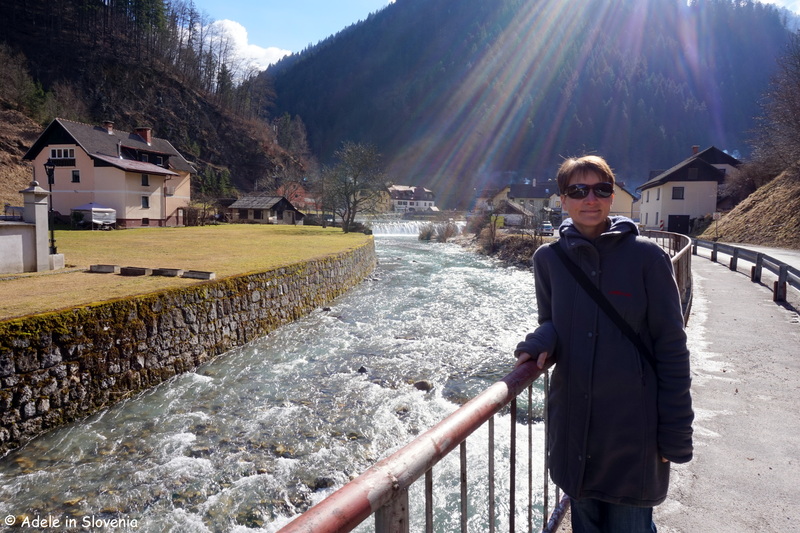 We crossed numerous bridges over the crystal clear Sora river. And visited Crngrob, home to the Church of the Annunciation, which is known for its treasured frescoes. 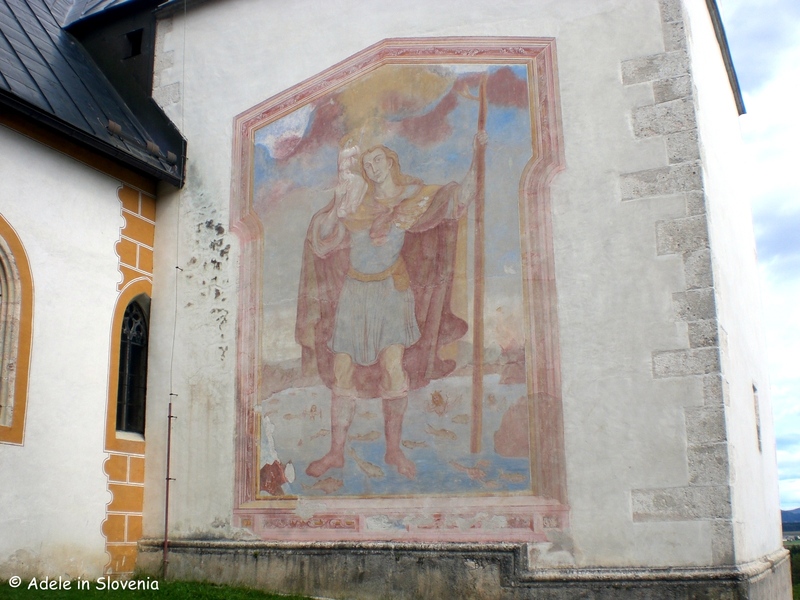 The pilgrimage church has a fresco of Saint Christopher with Jesus on his shoulder on the front façade, whilst in the shelter of the neo-gothic porch on the facade, the fresco of Holy Sunday can be seen. 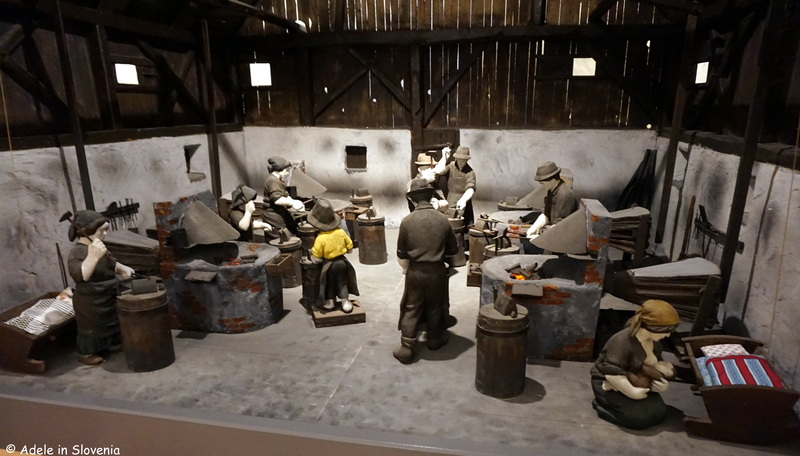 This originates from the middle of the 15th century and shows tasks which were at the time prohibited on Sundays. 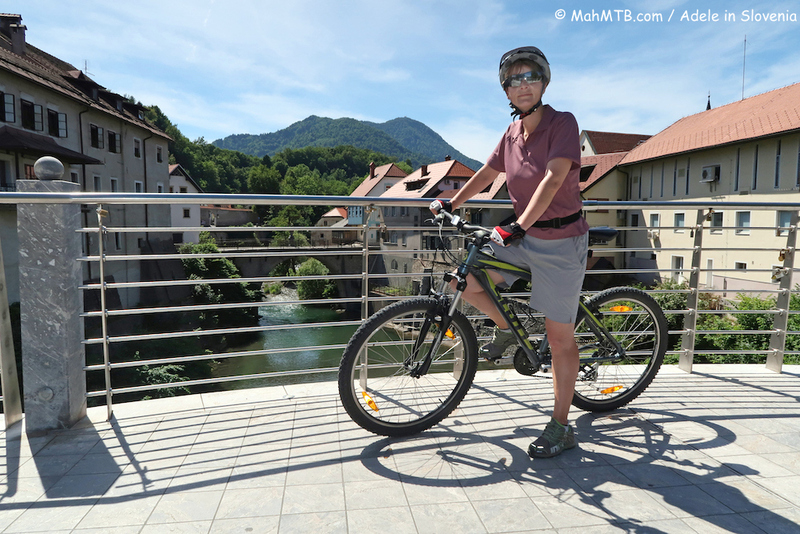 Just one more reminder of my trip to round off this scenic cycling blog!